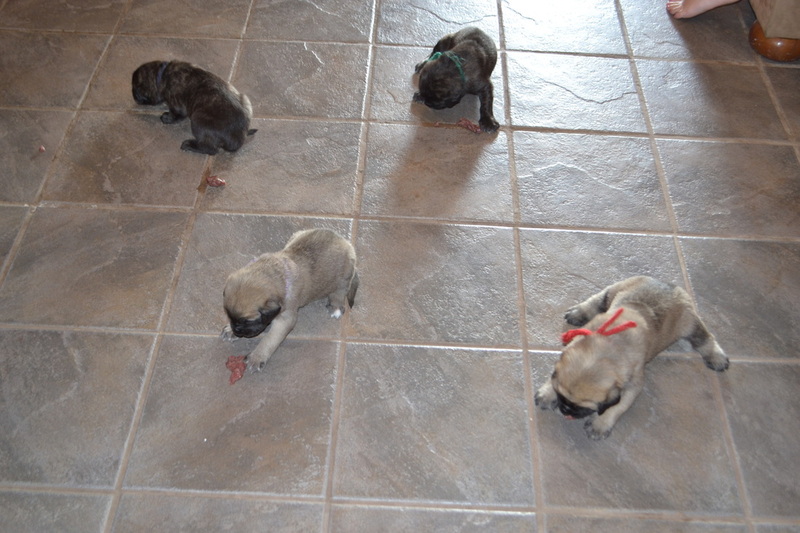 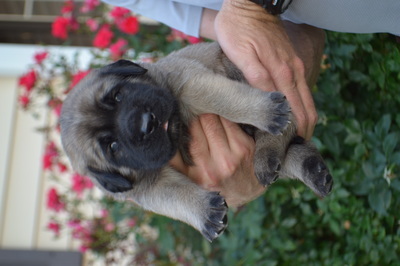 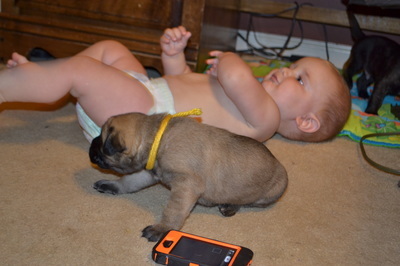 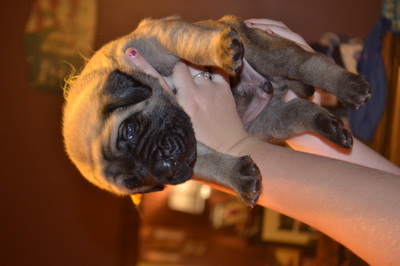 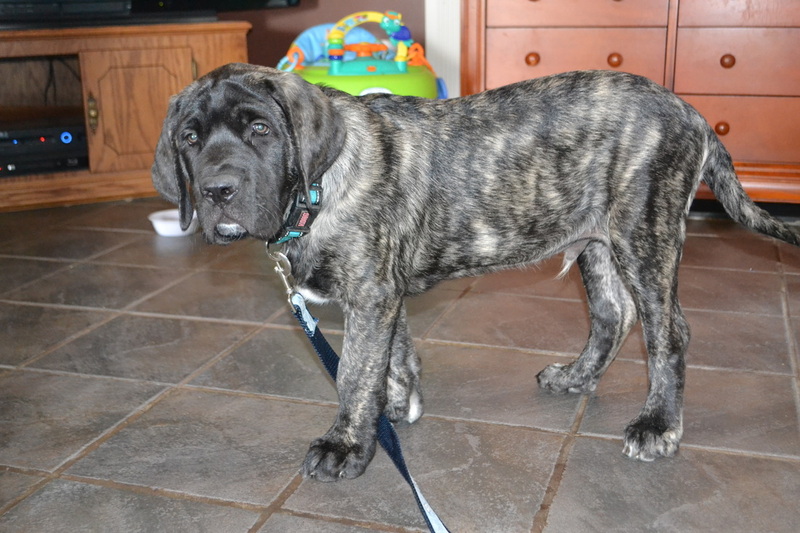 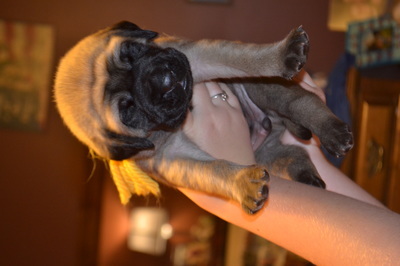 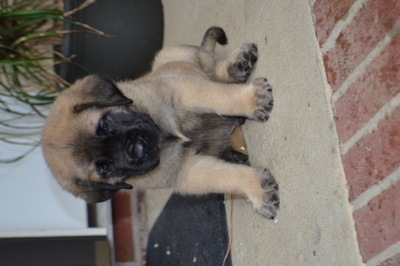 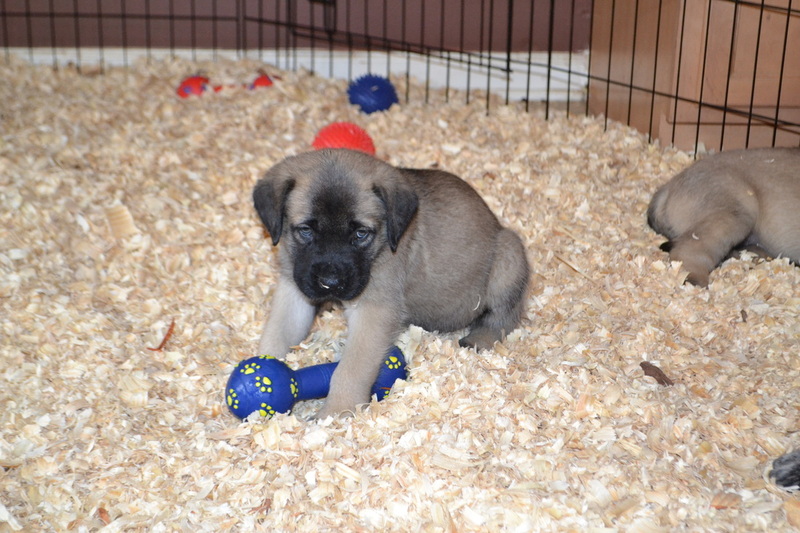 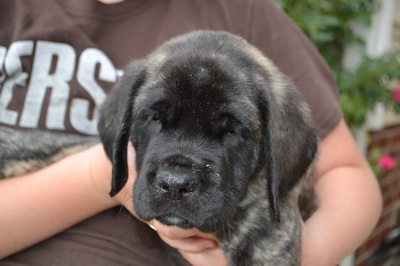 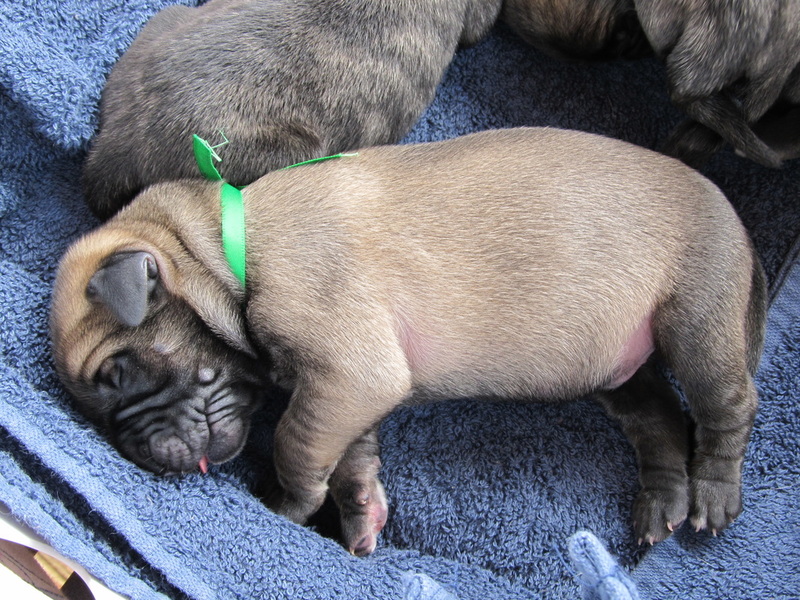 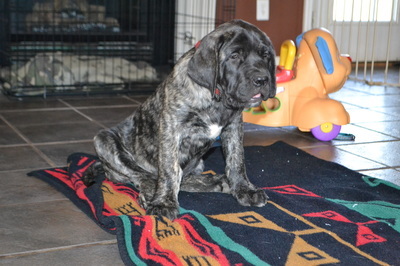 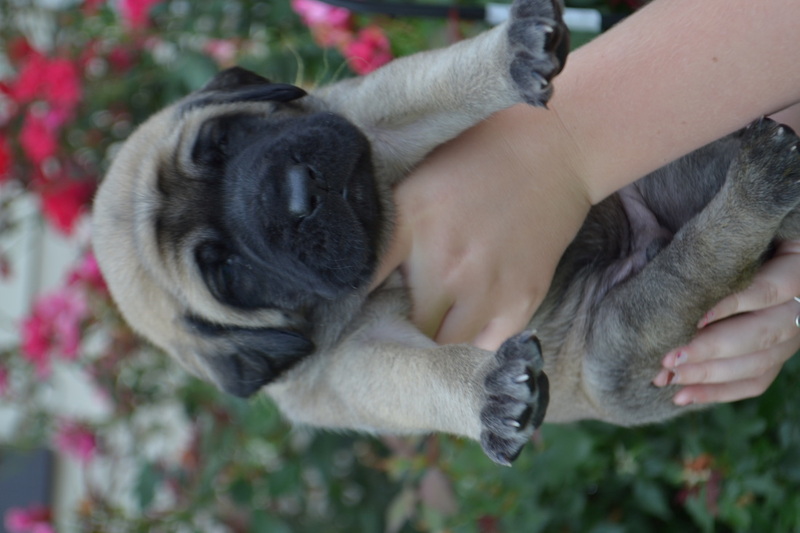 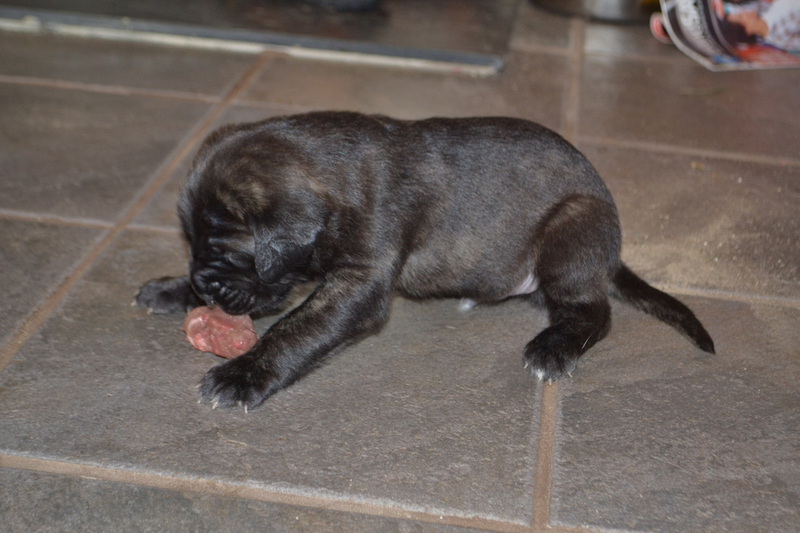 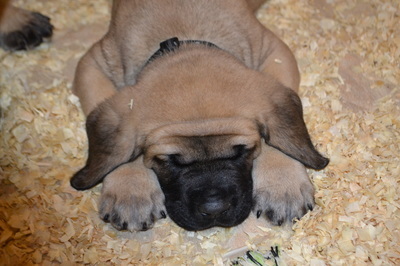 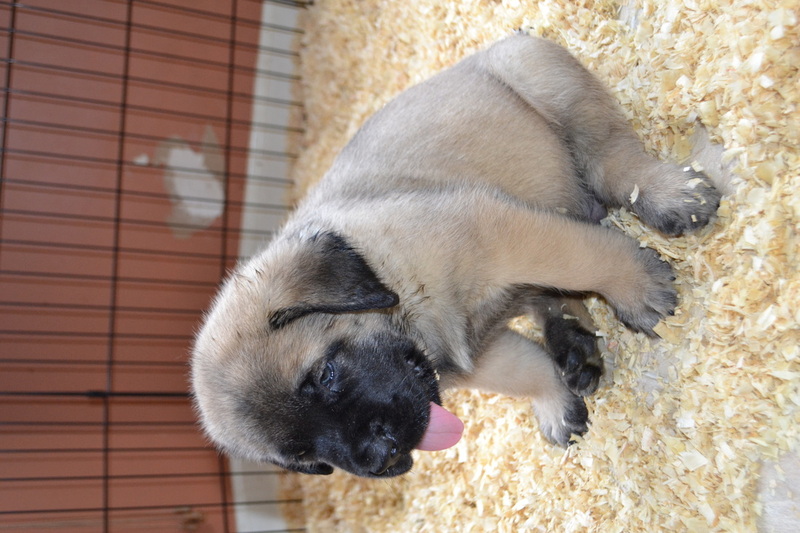 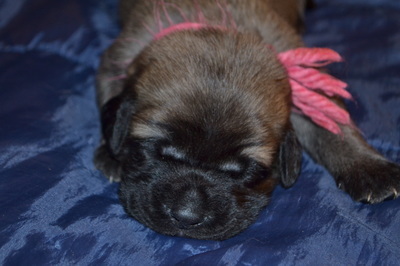 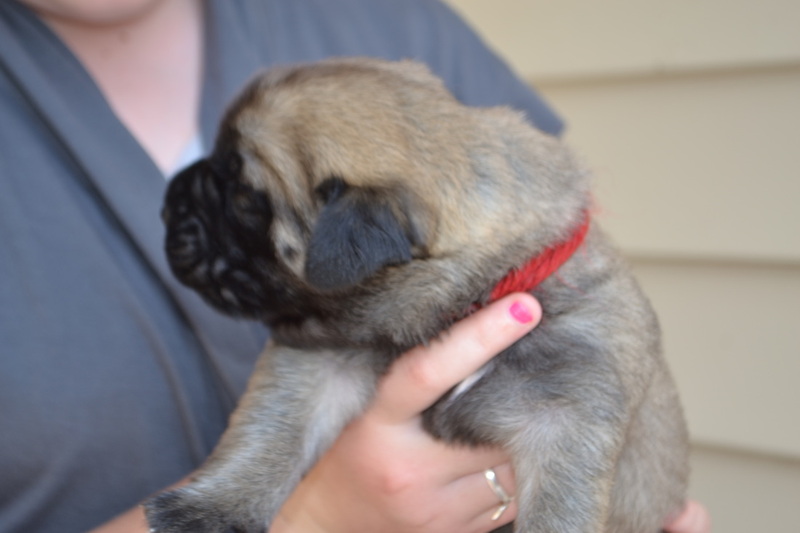 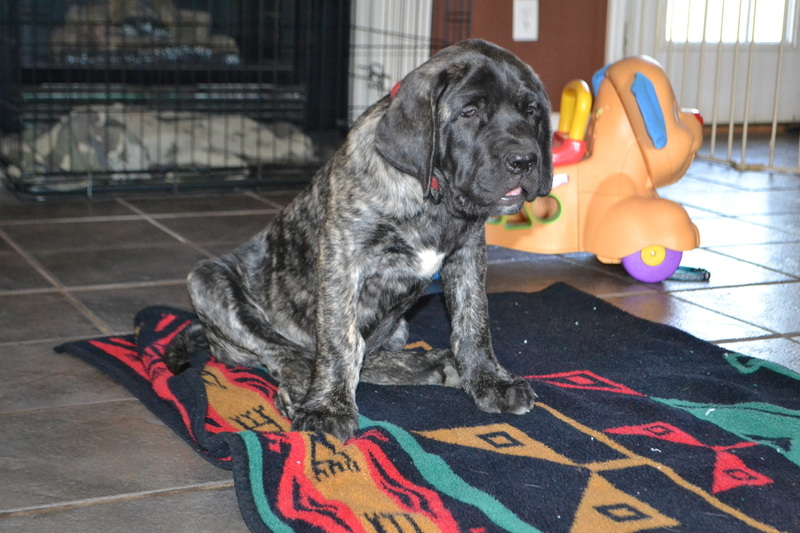 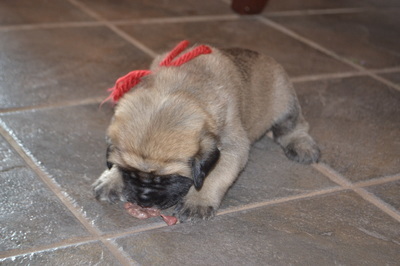 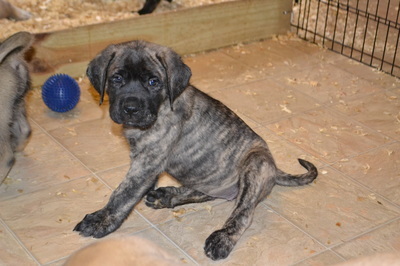 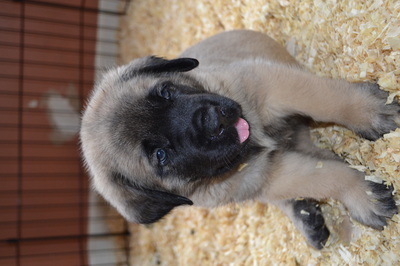 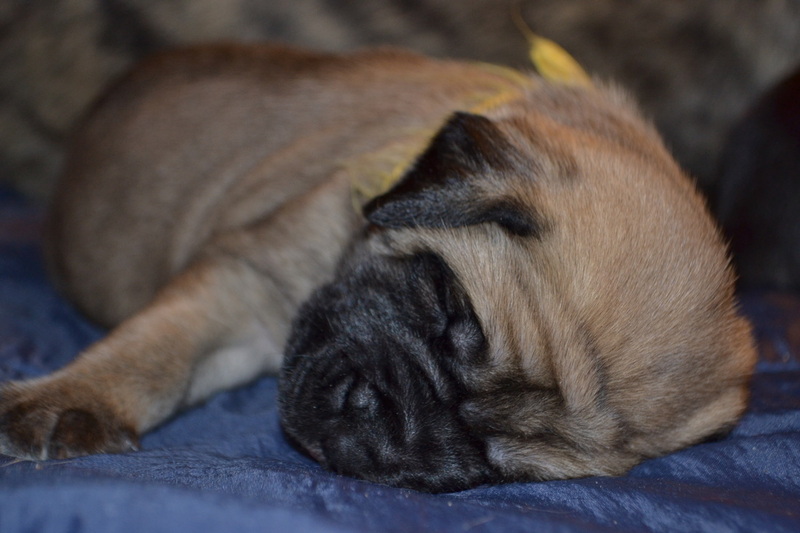 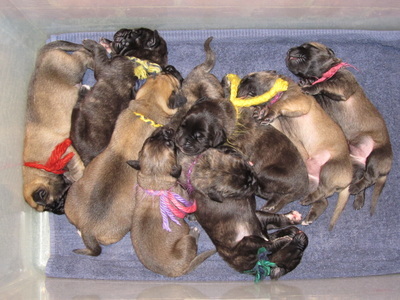 These are pictures from birth until the puppies were old enough to leave us at 9 weeks of age. 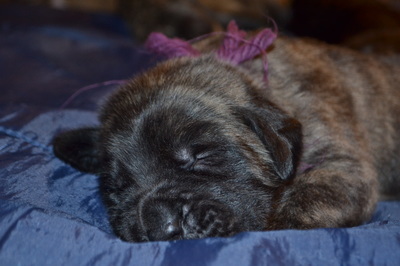 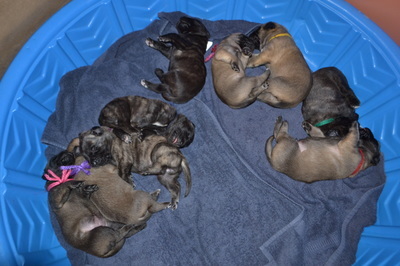 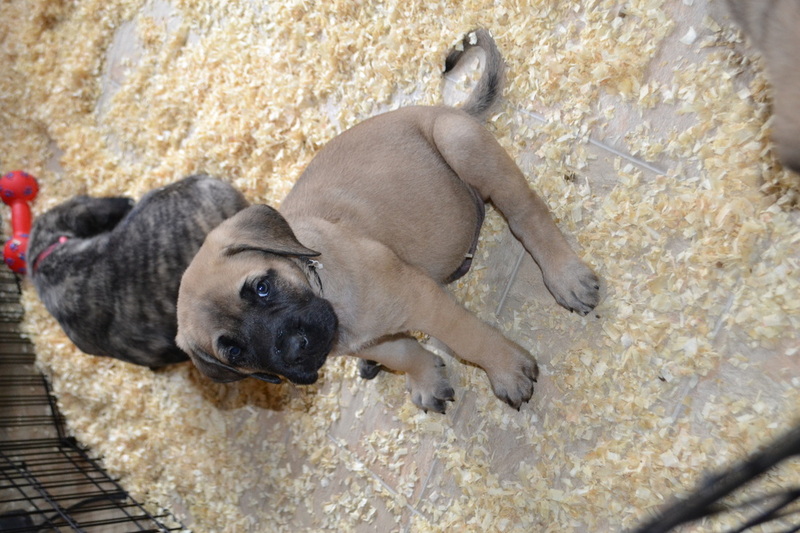 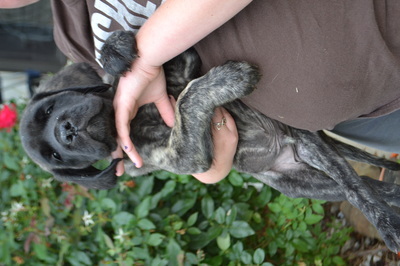 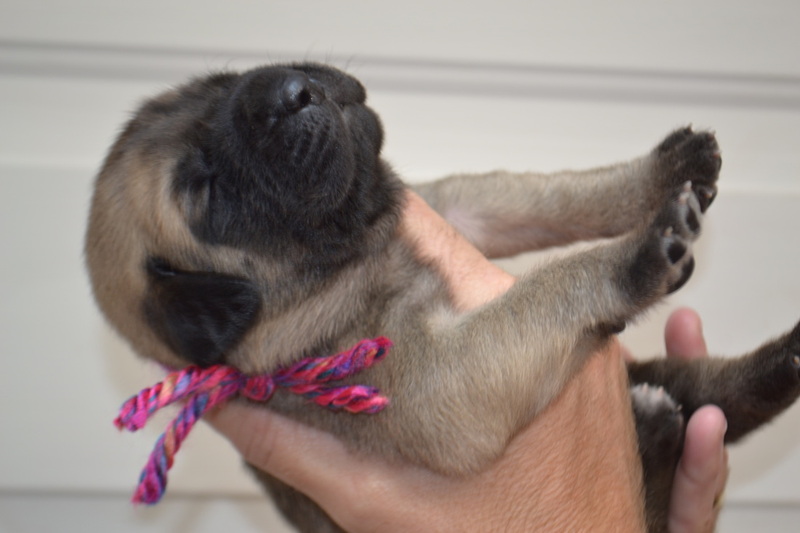 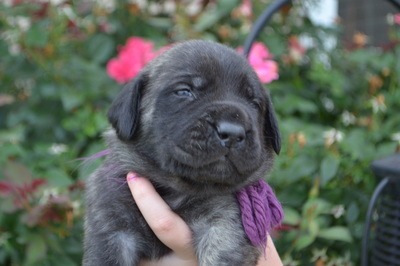 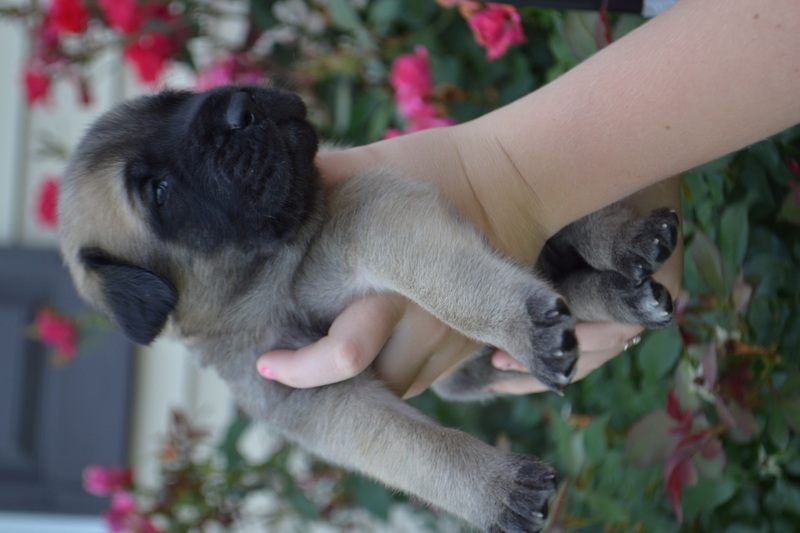 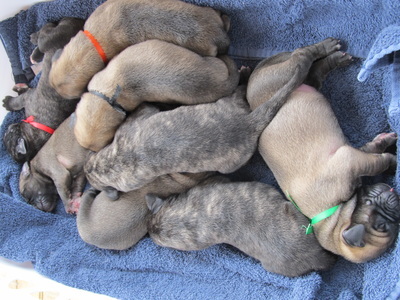 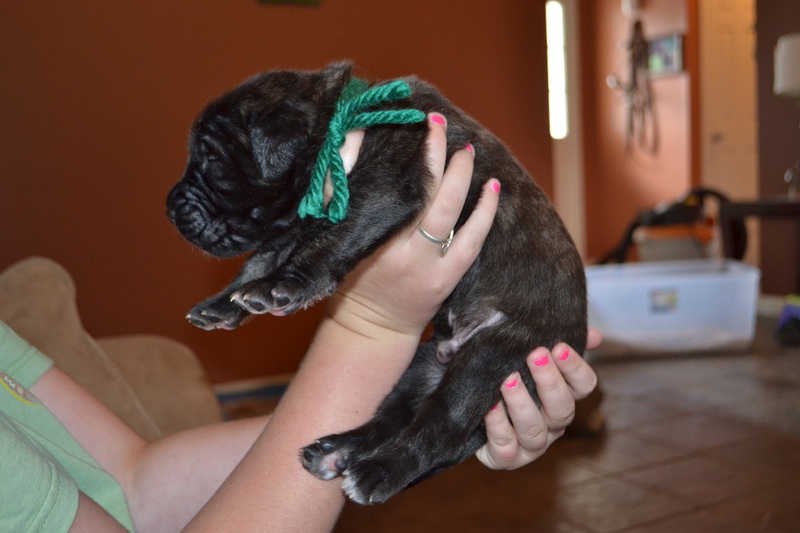 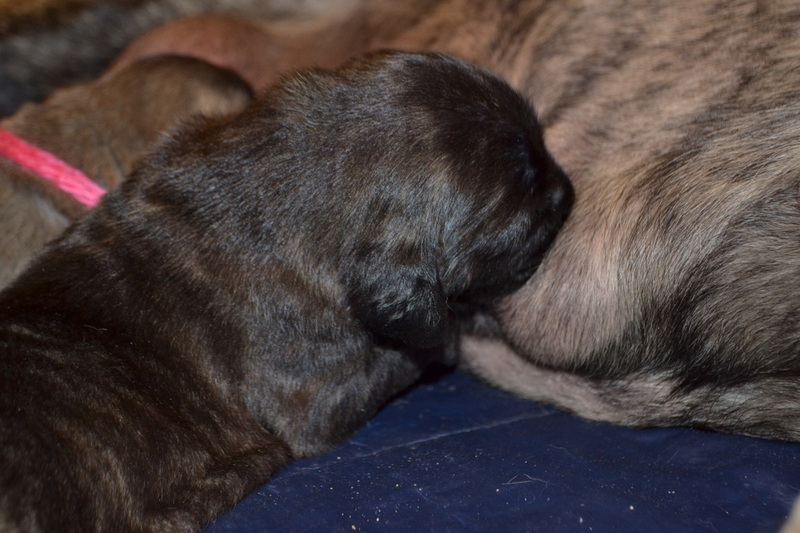 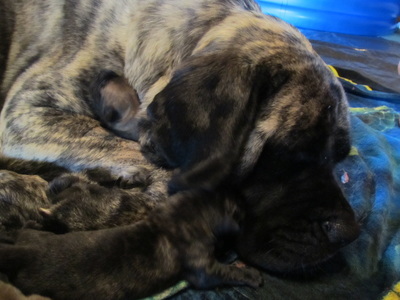 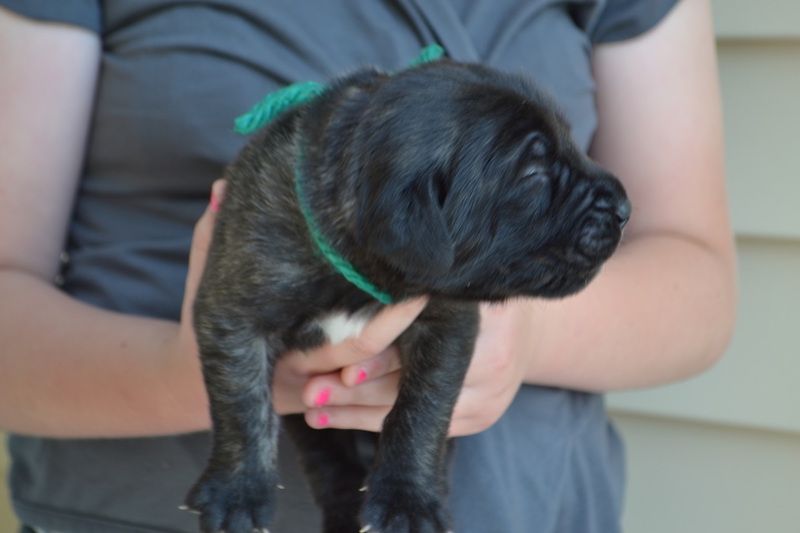 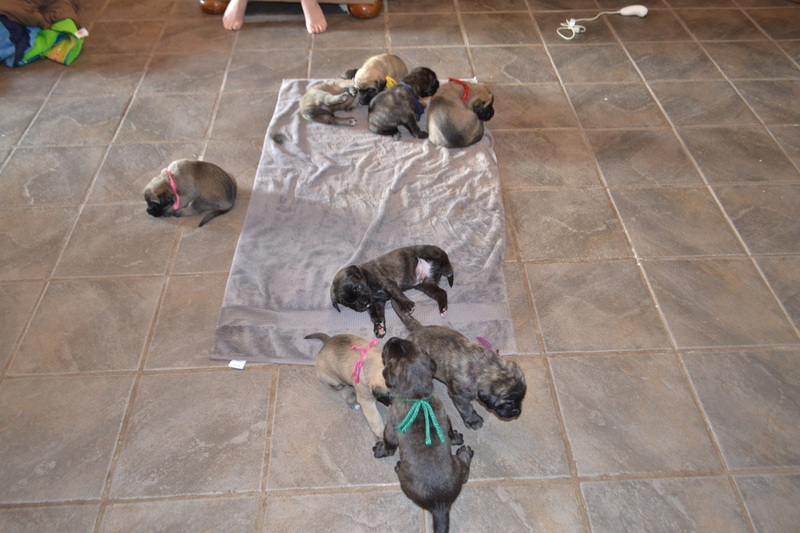 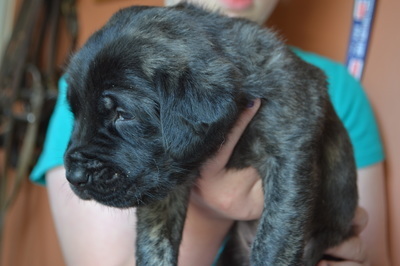 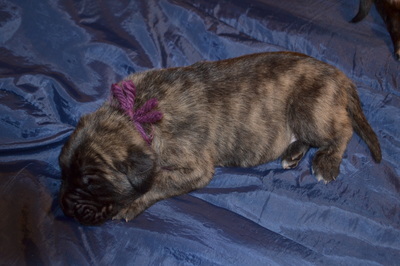 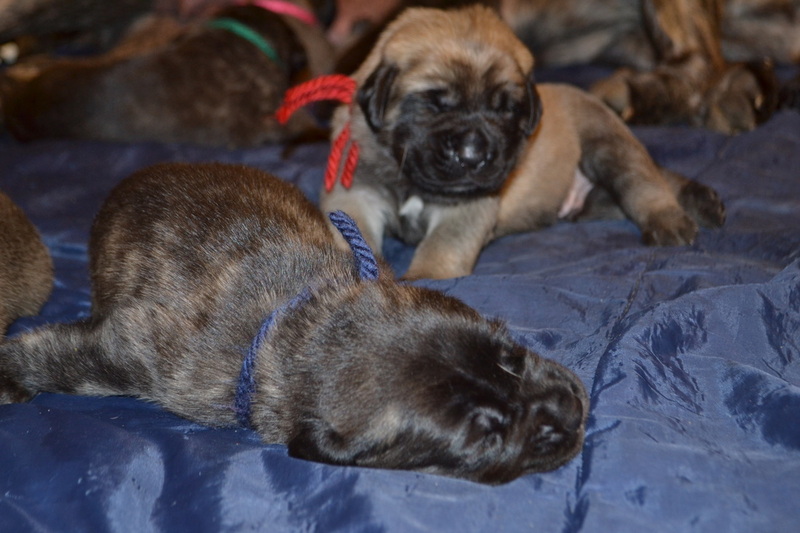 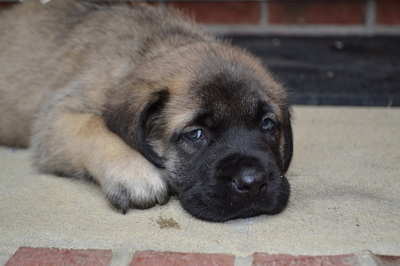 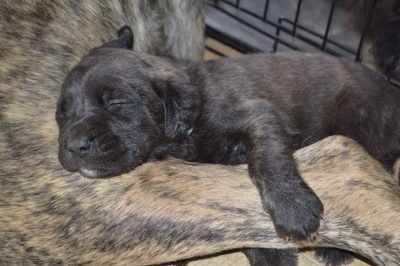 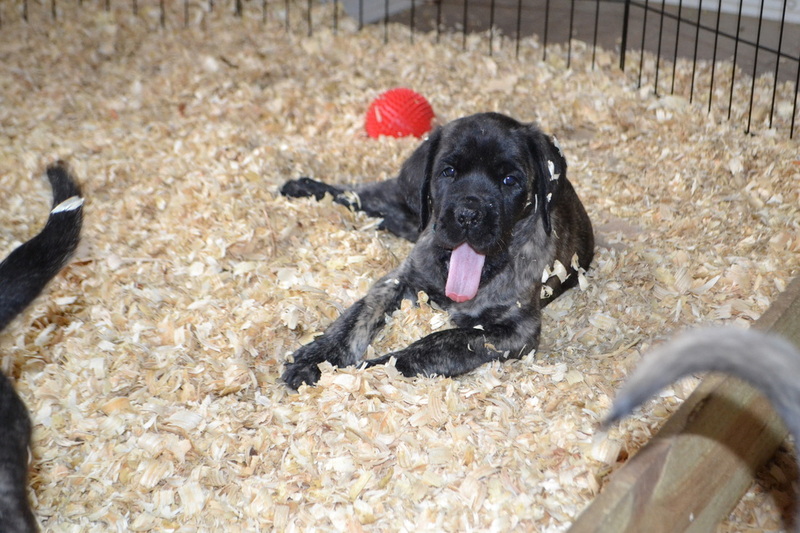 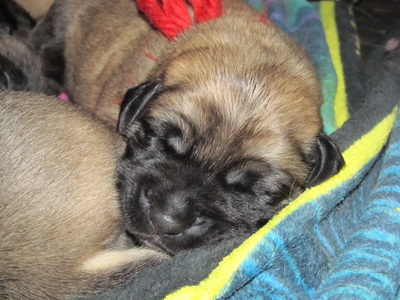 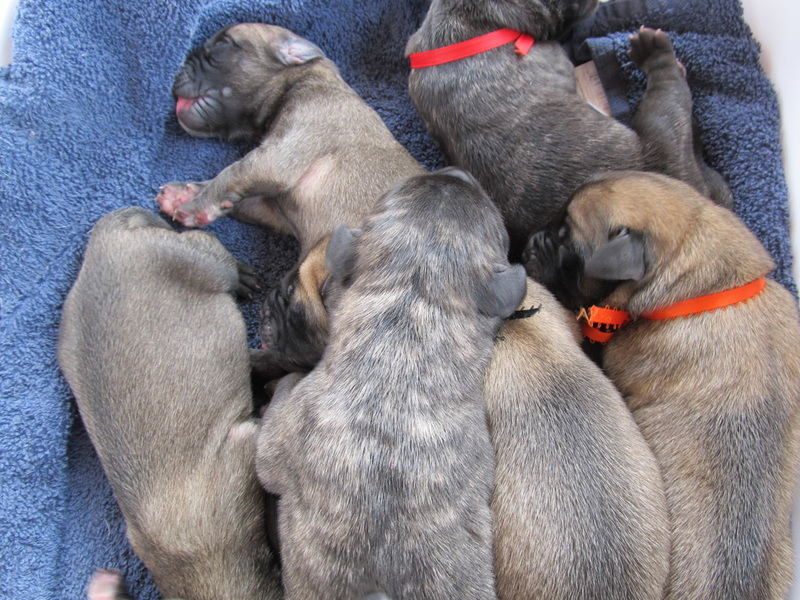 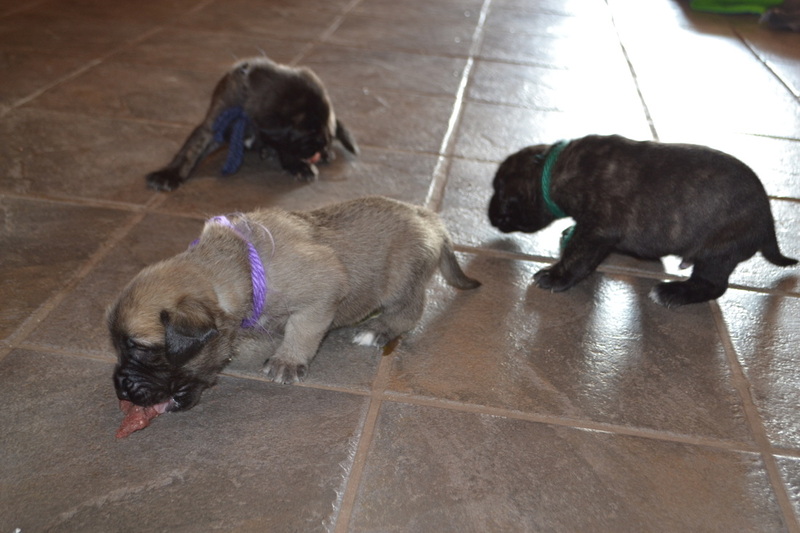 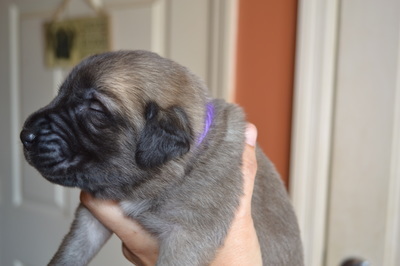 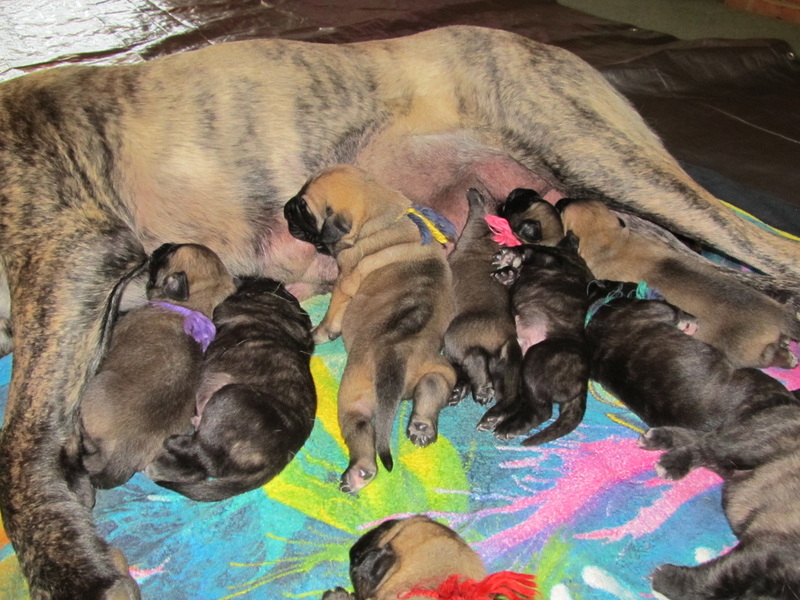 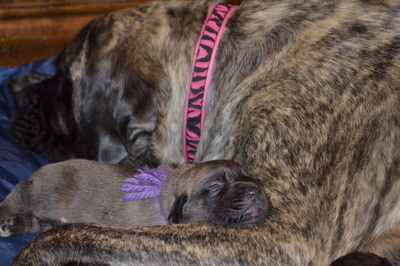 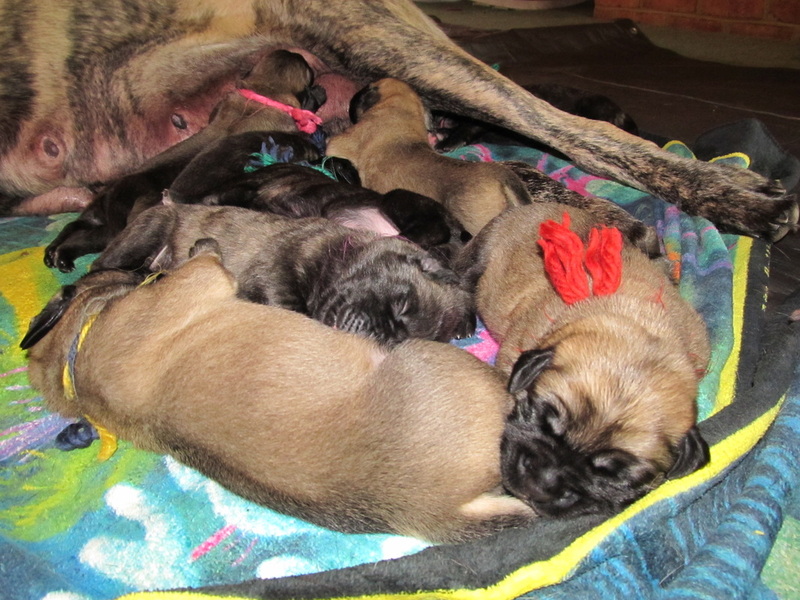 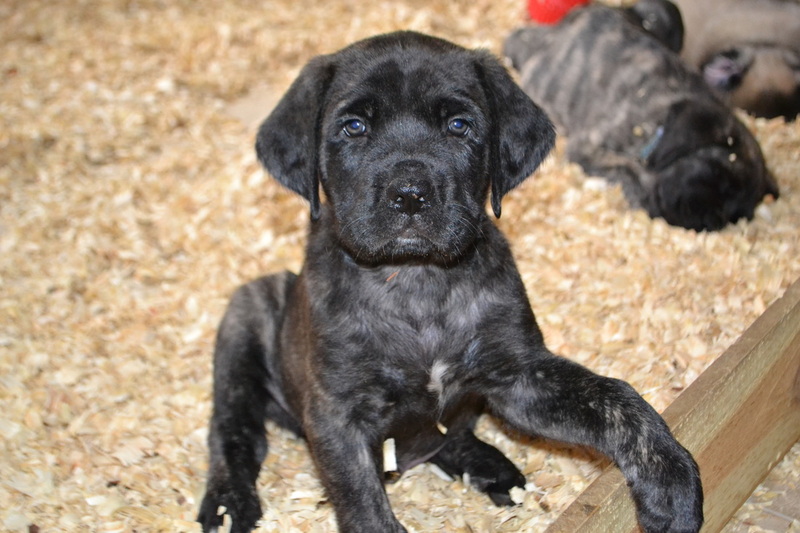 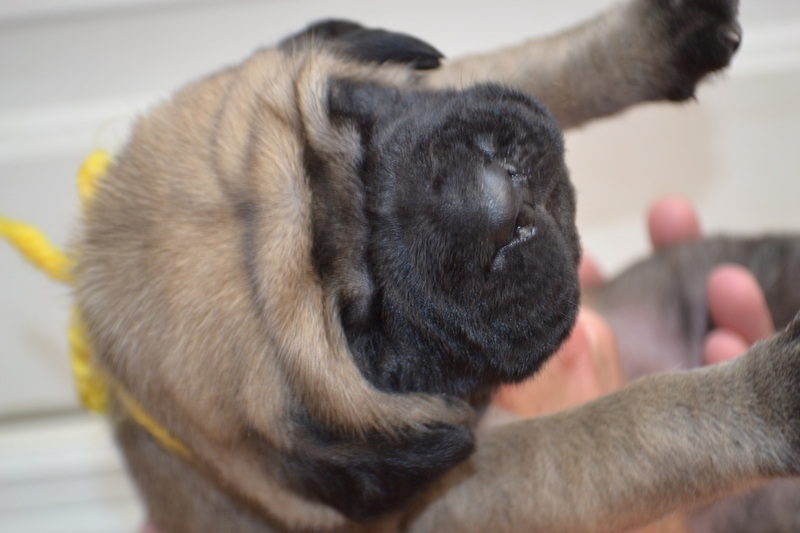 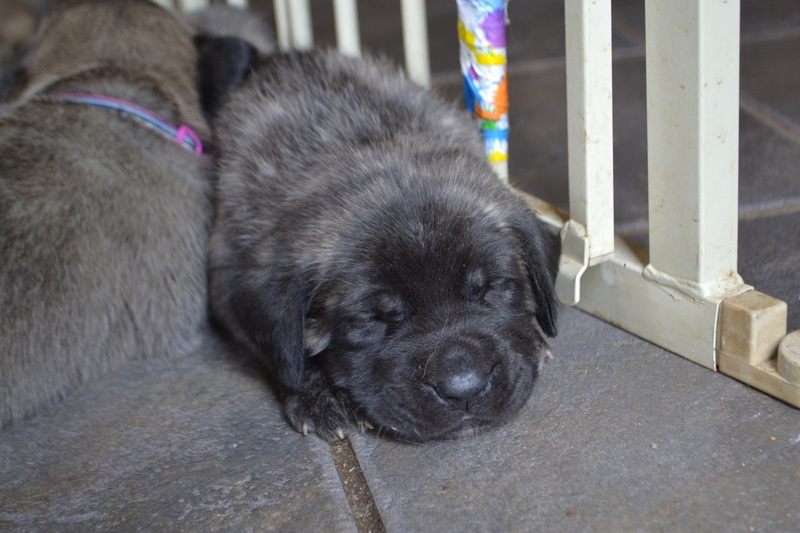 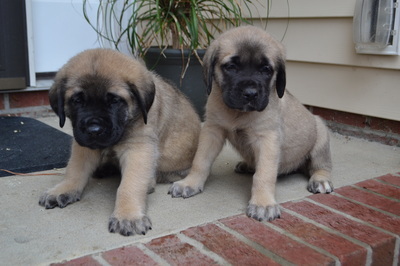 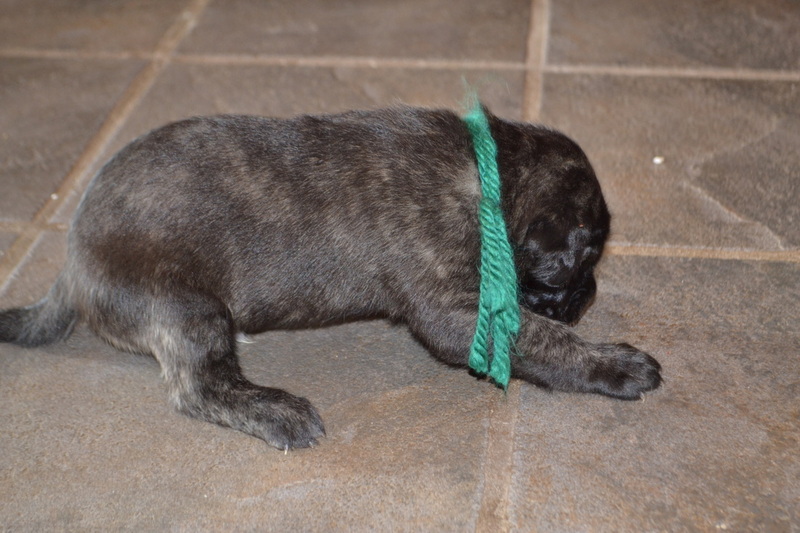 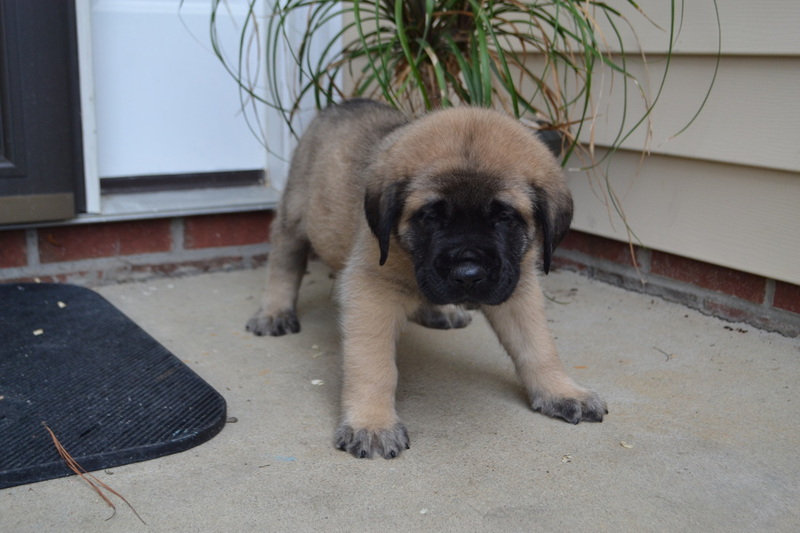 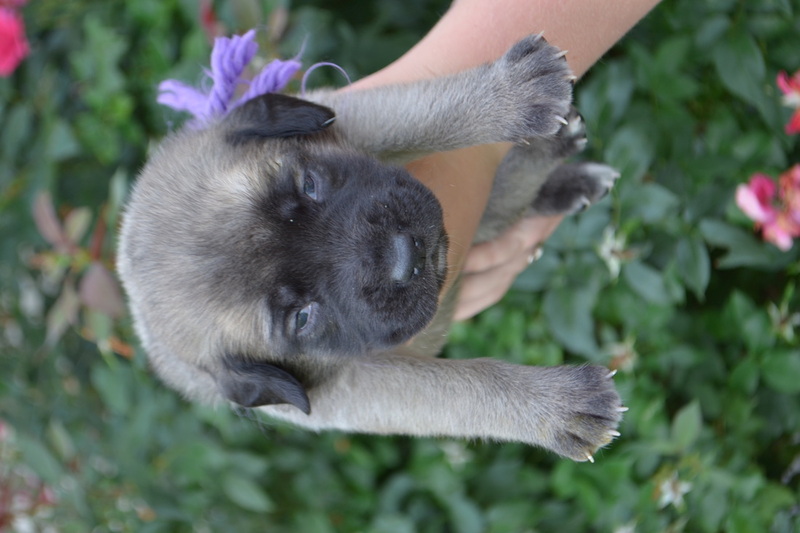 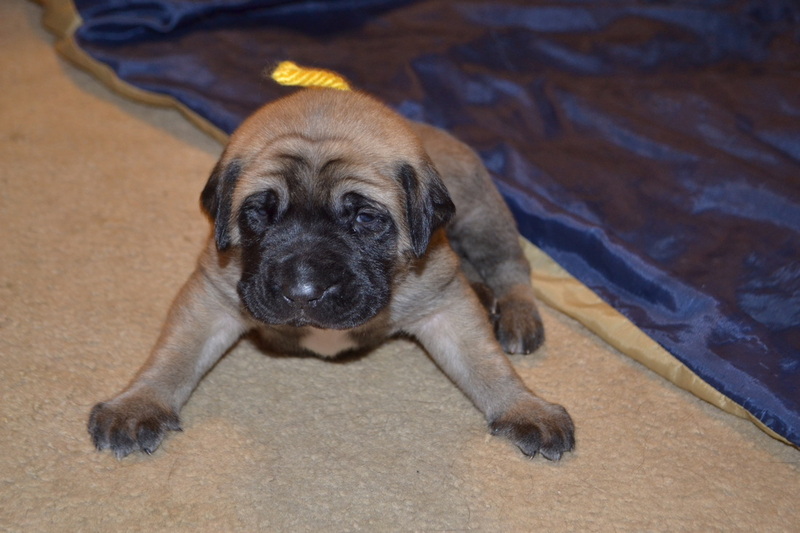 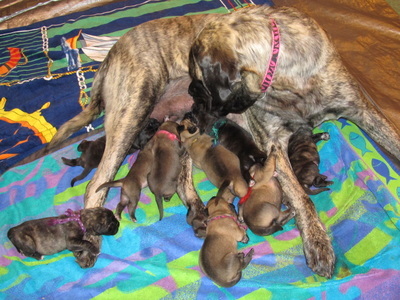 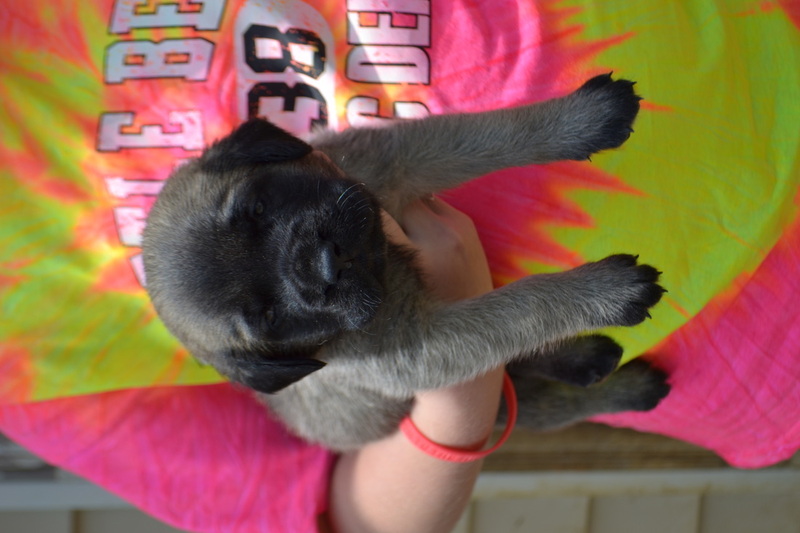 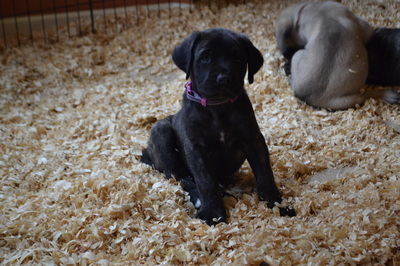 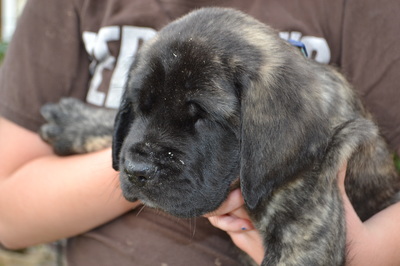 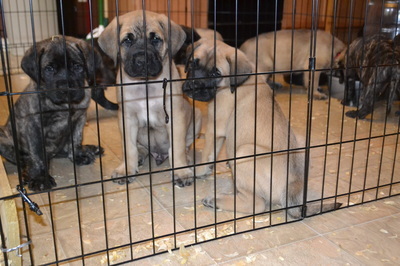 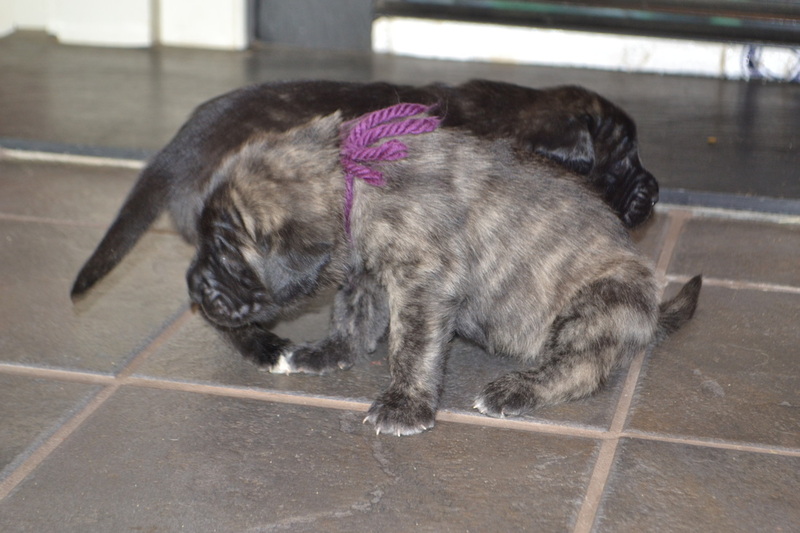 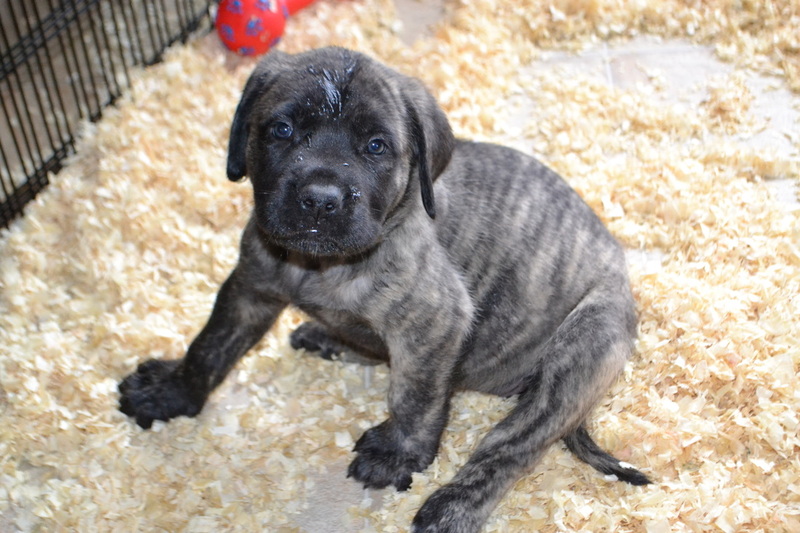 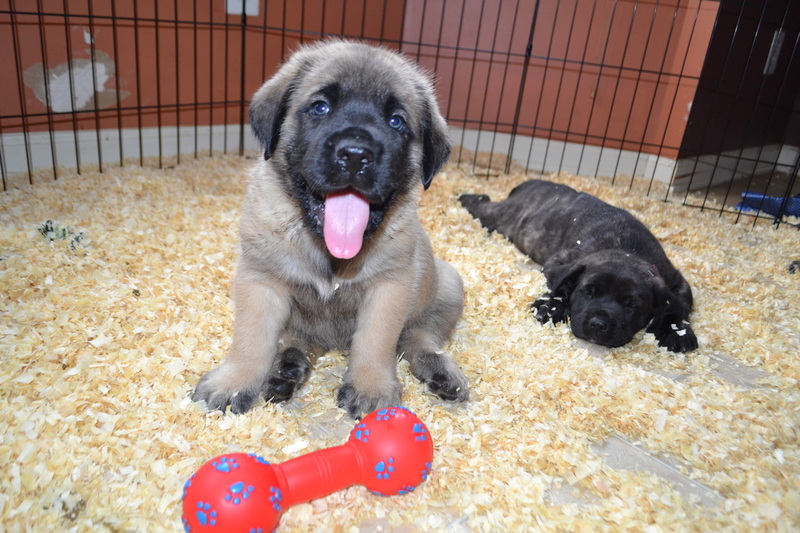 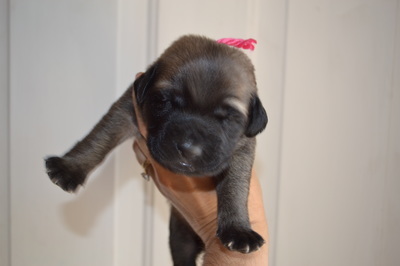 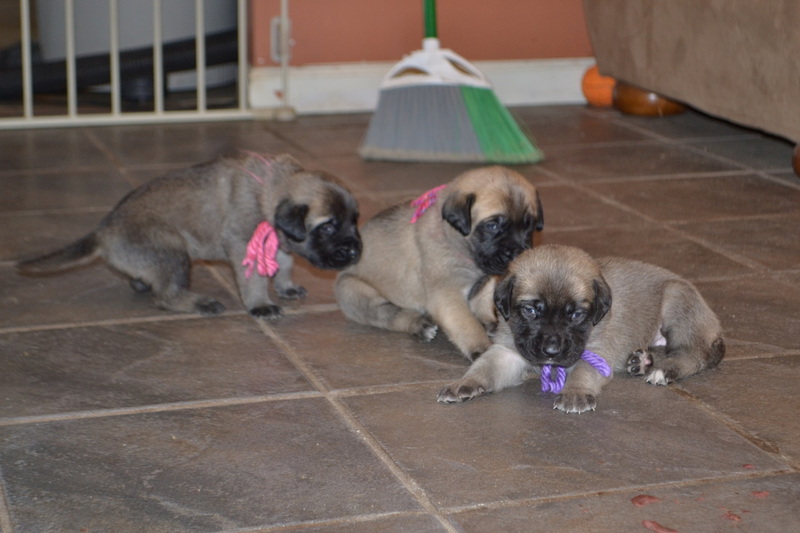 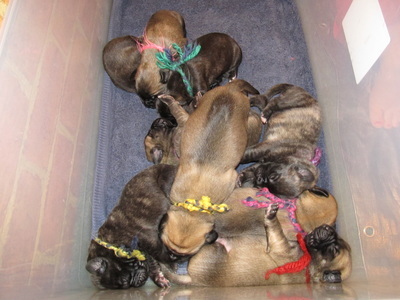 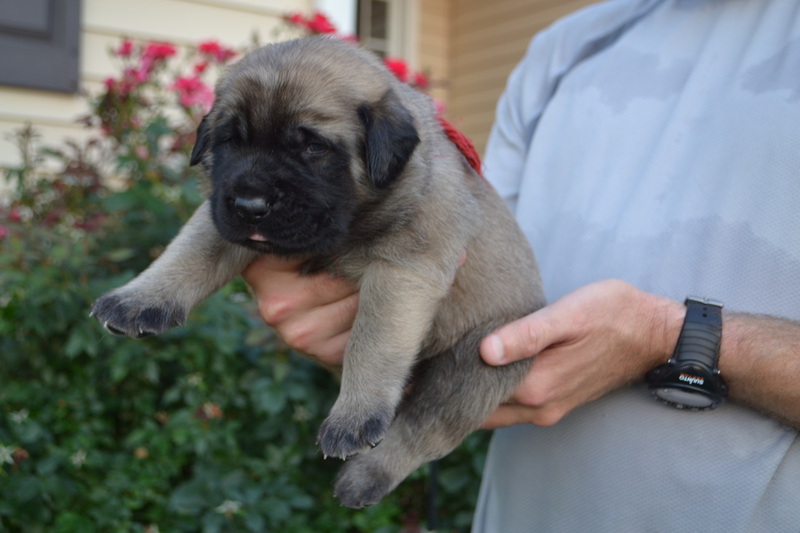 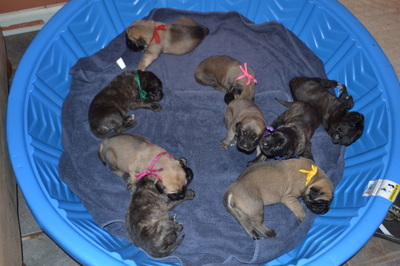 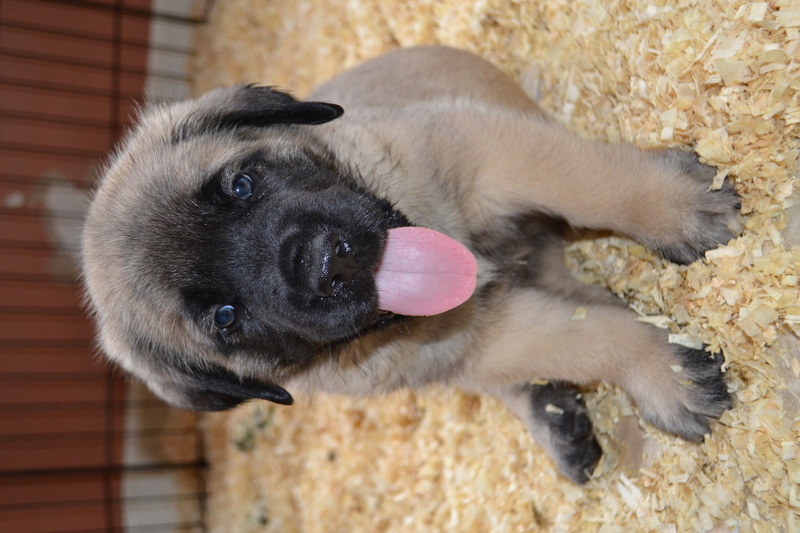 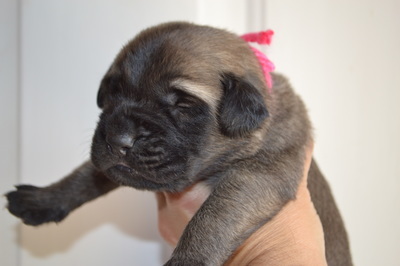 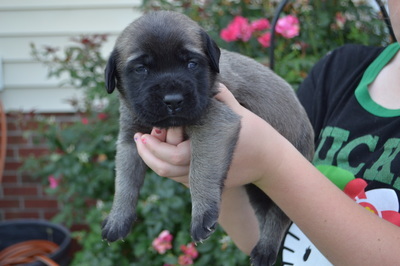 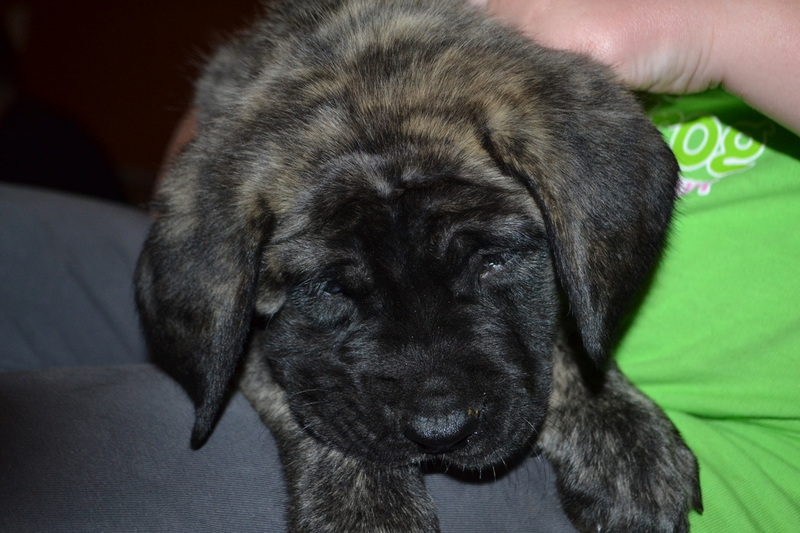 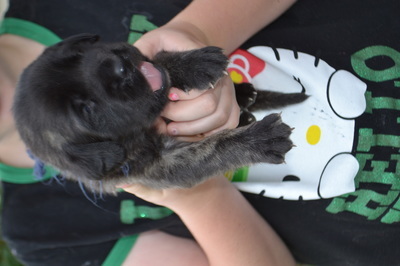 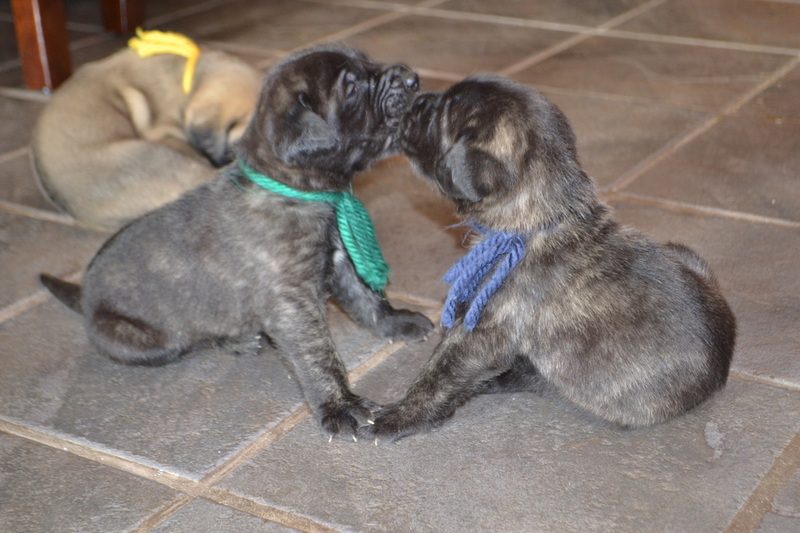 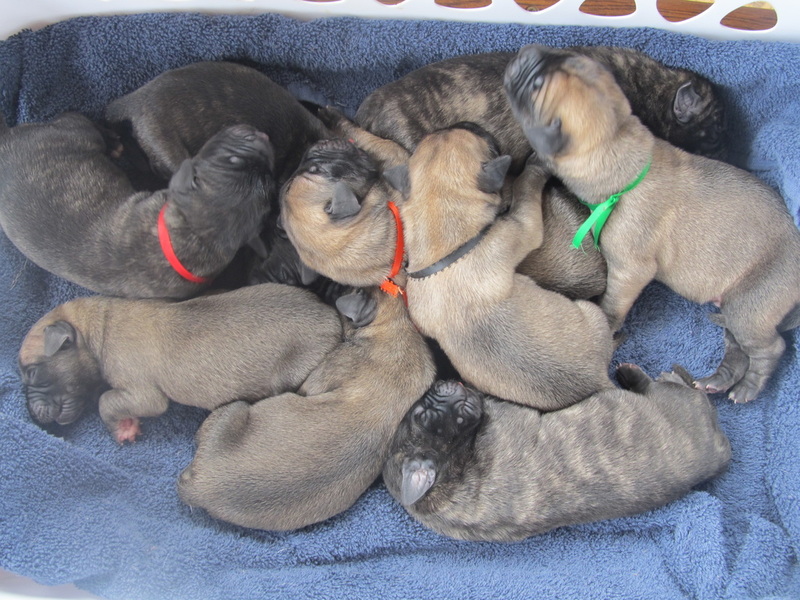 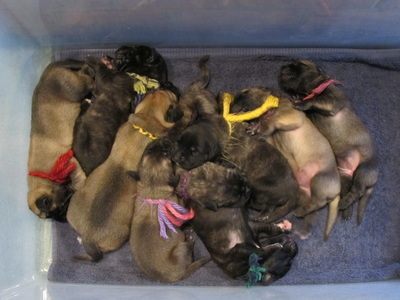 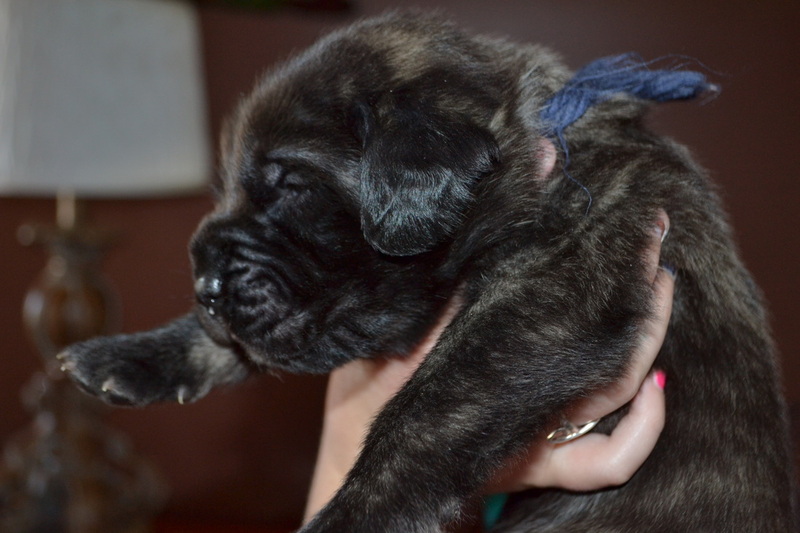 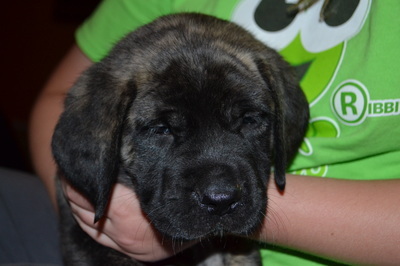 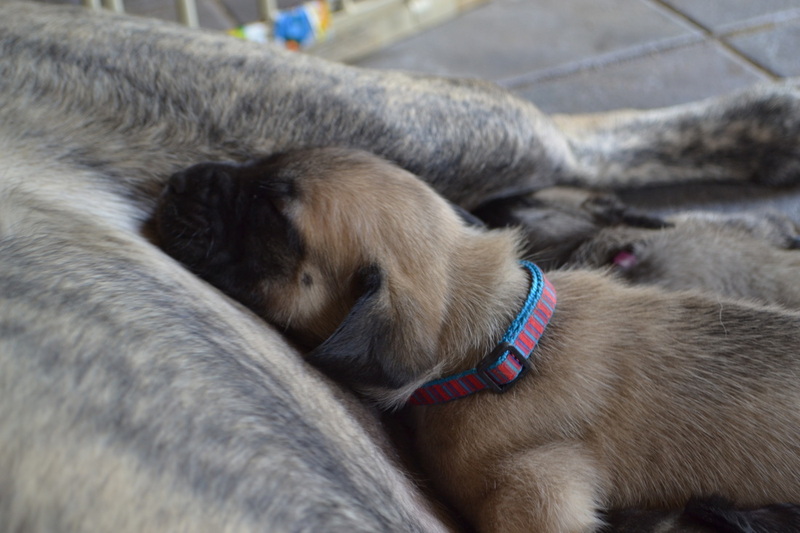 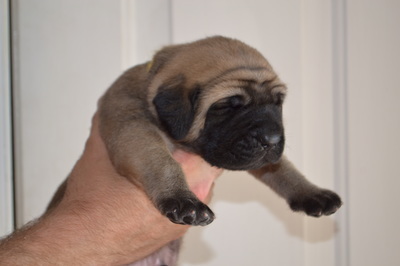 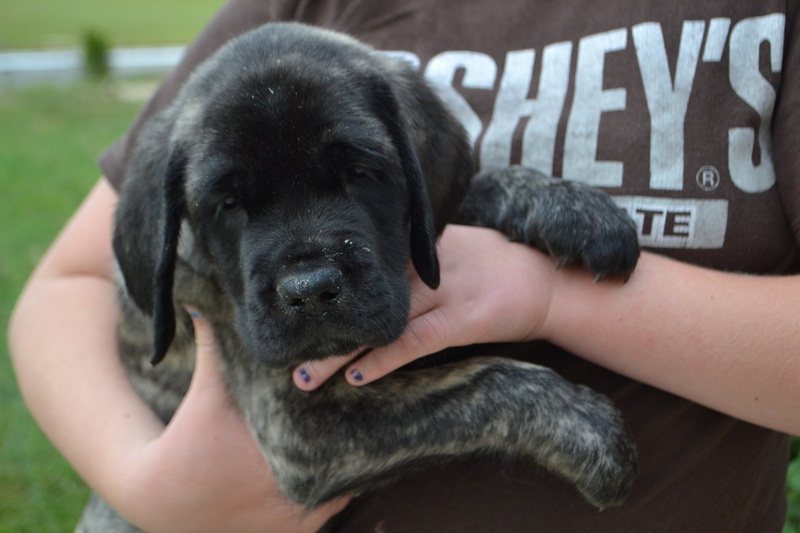 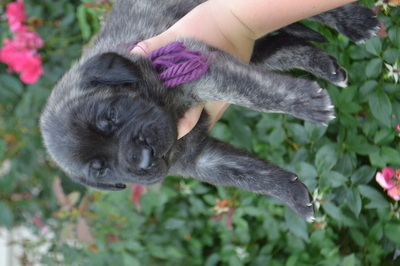 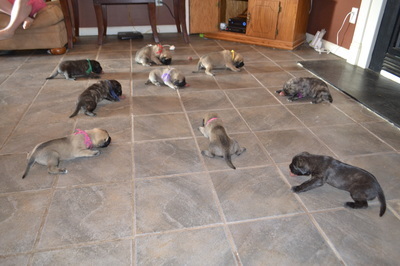 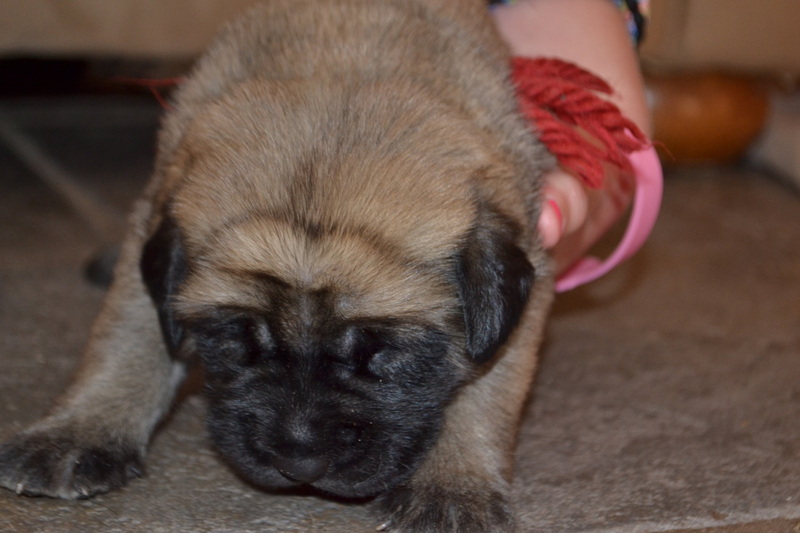 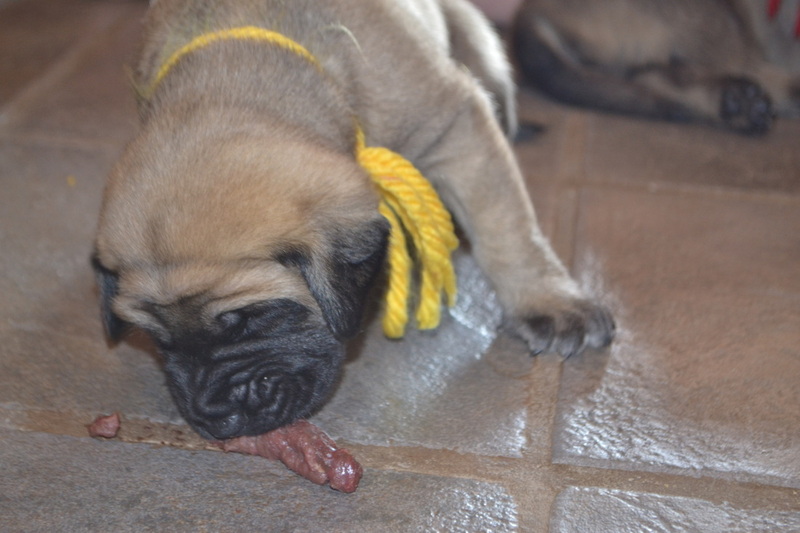 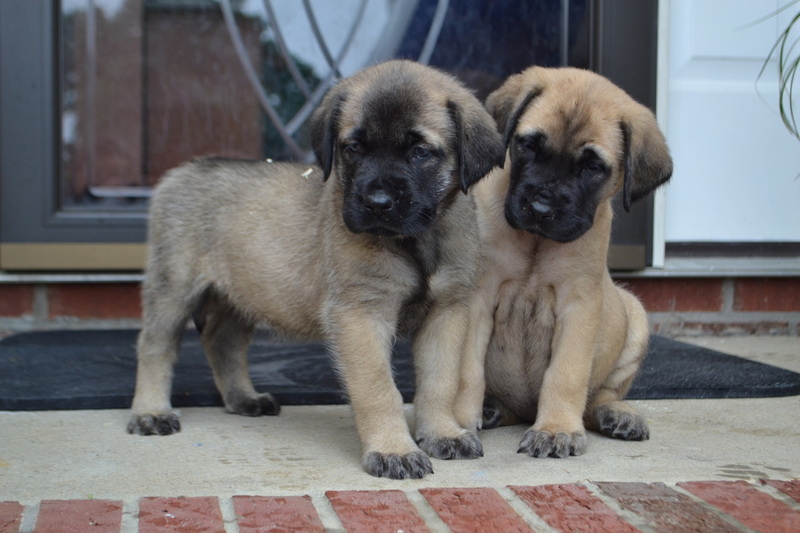 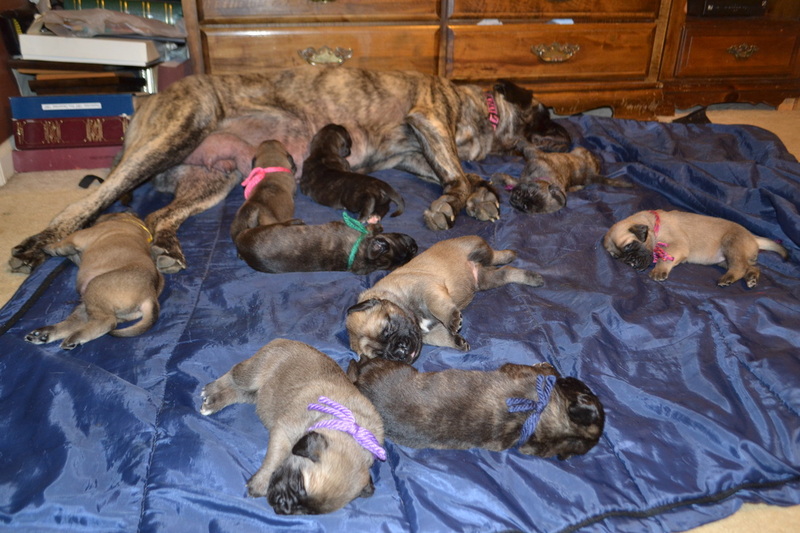 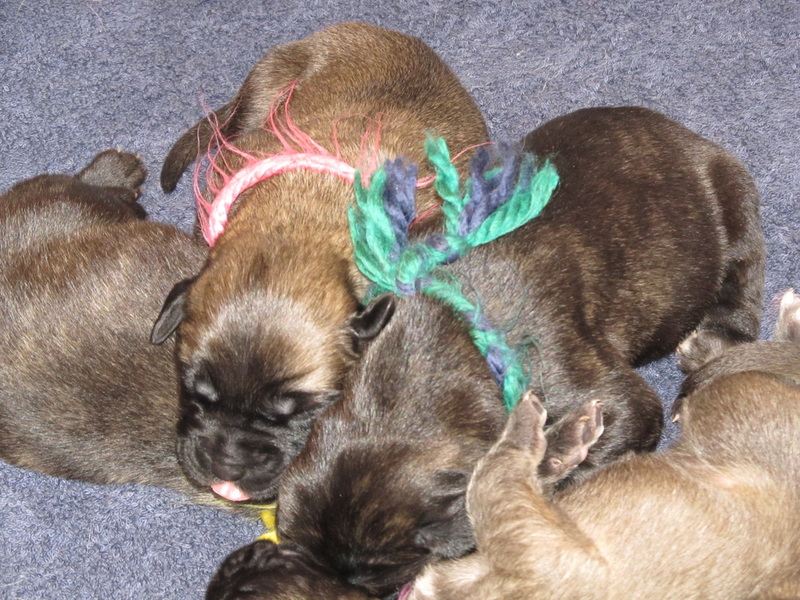 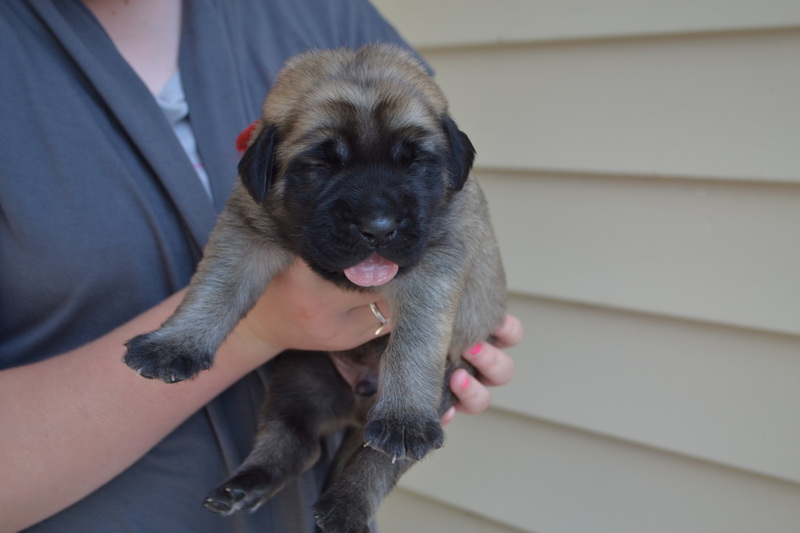 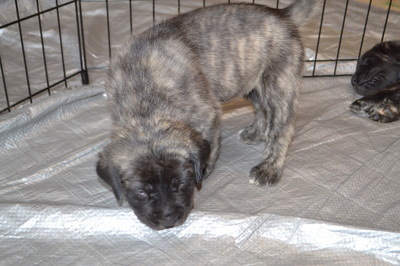 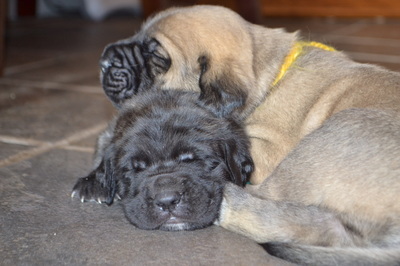 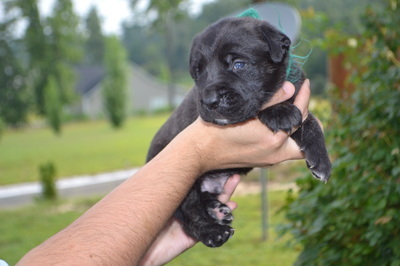 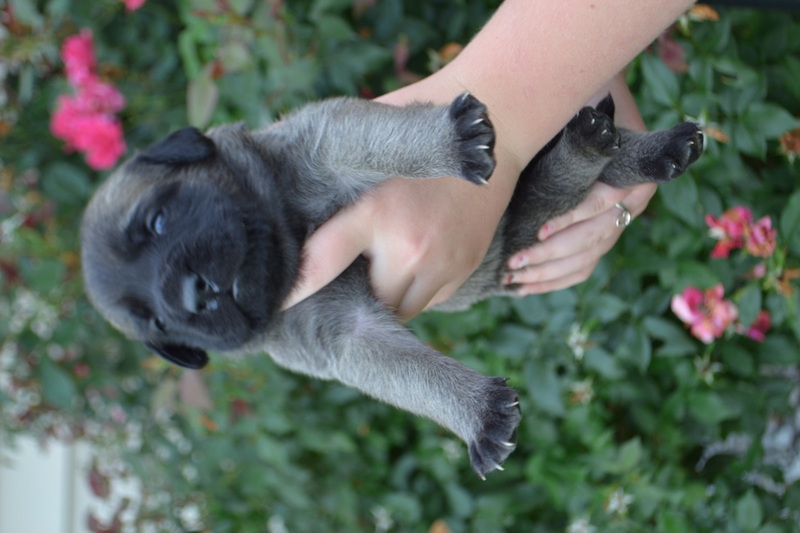 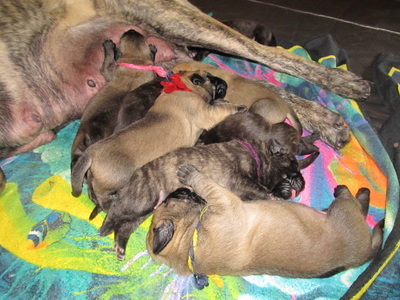 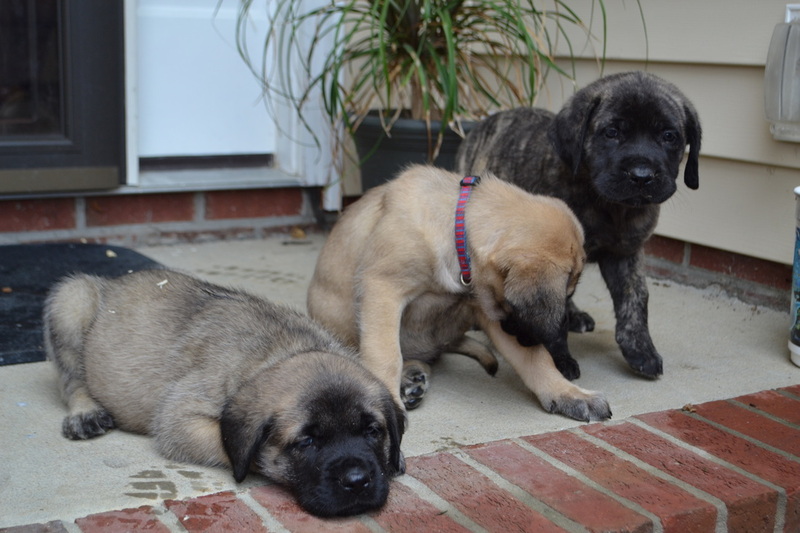 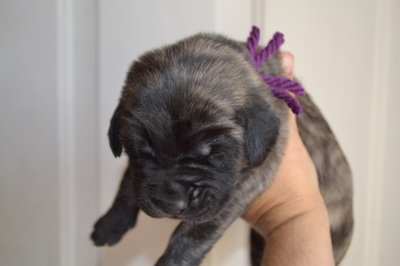 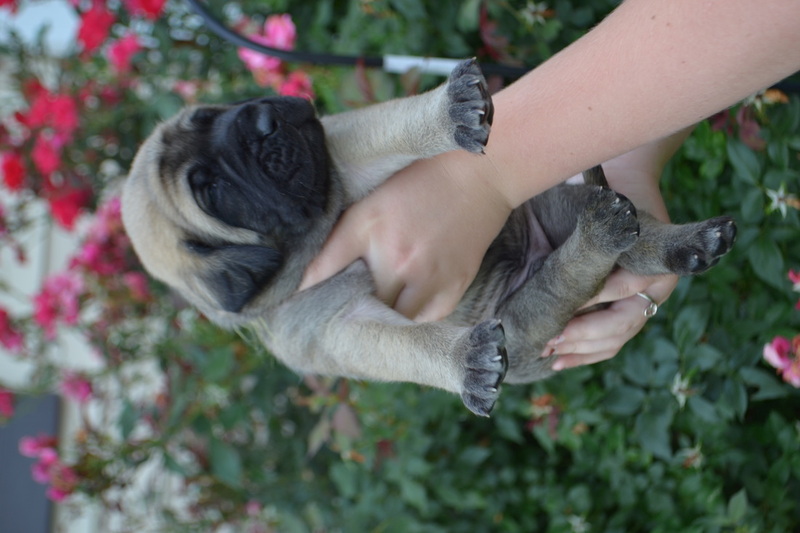 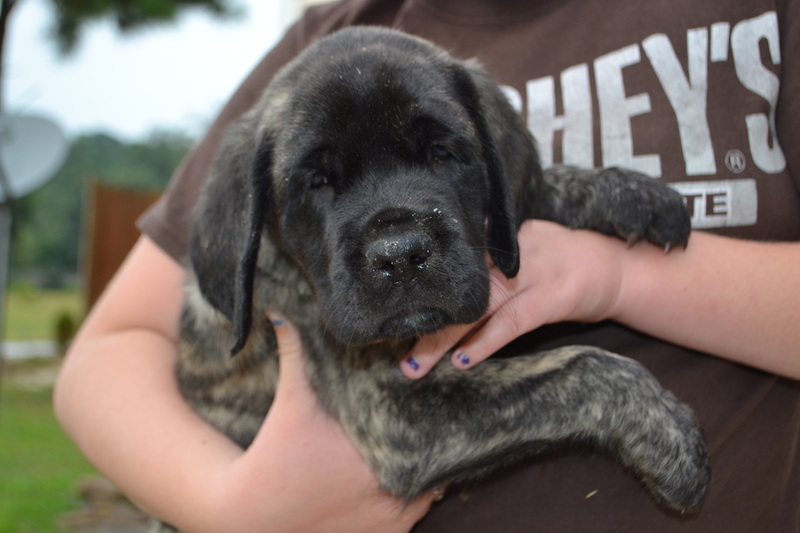 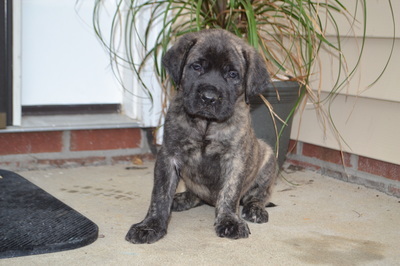 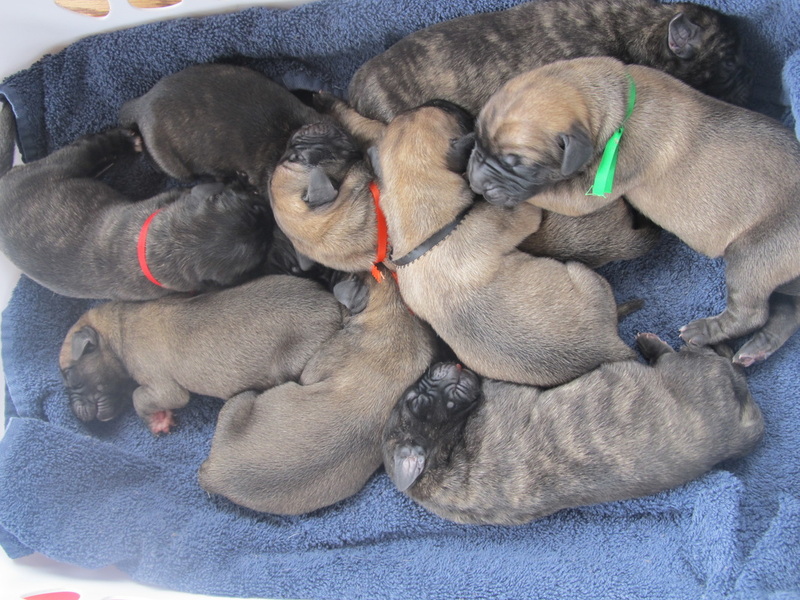 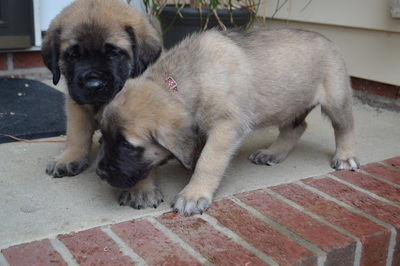 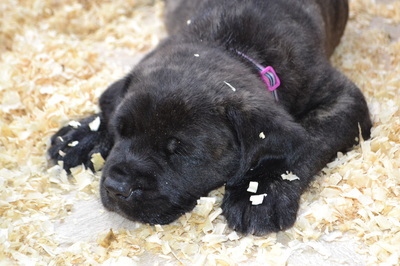 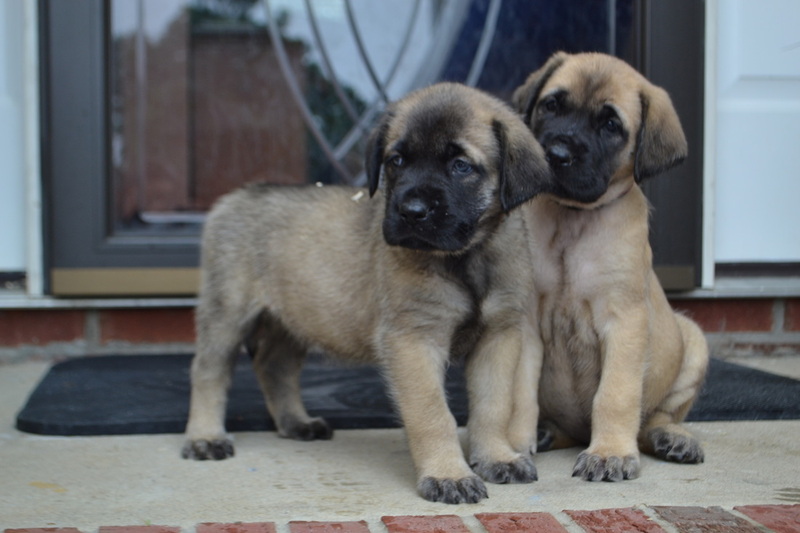 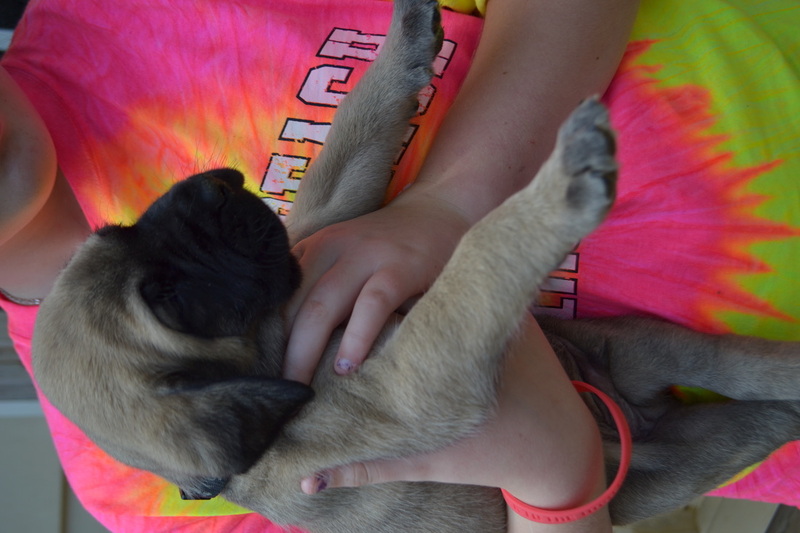 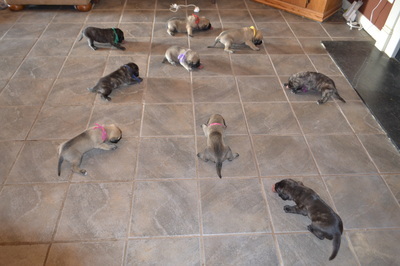 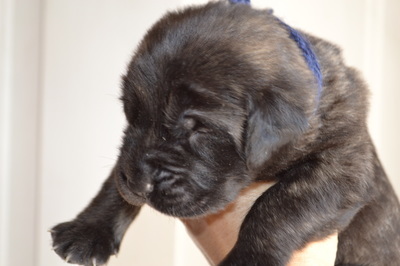 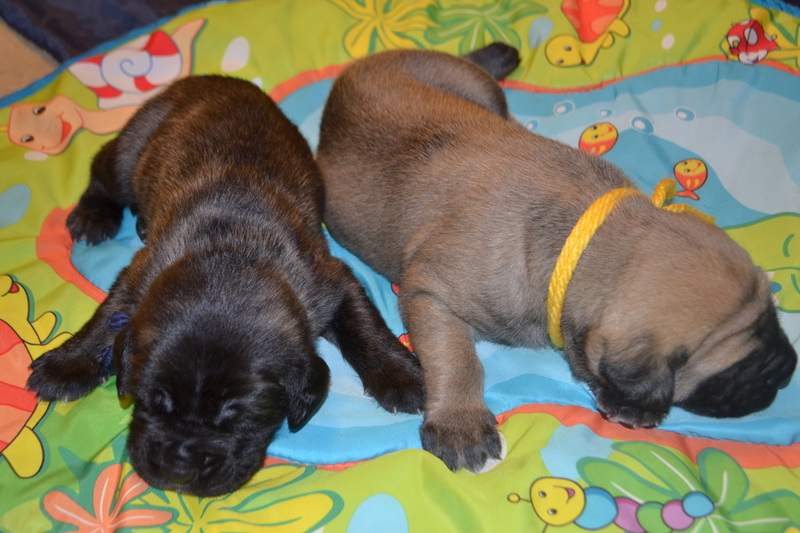 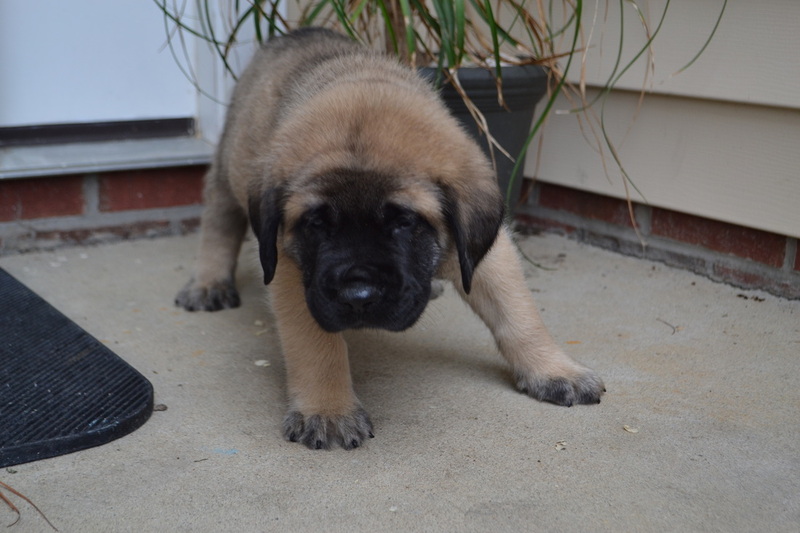 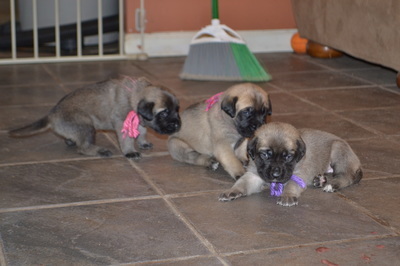 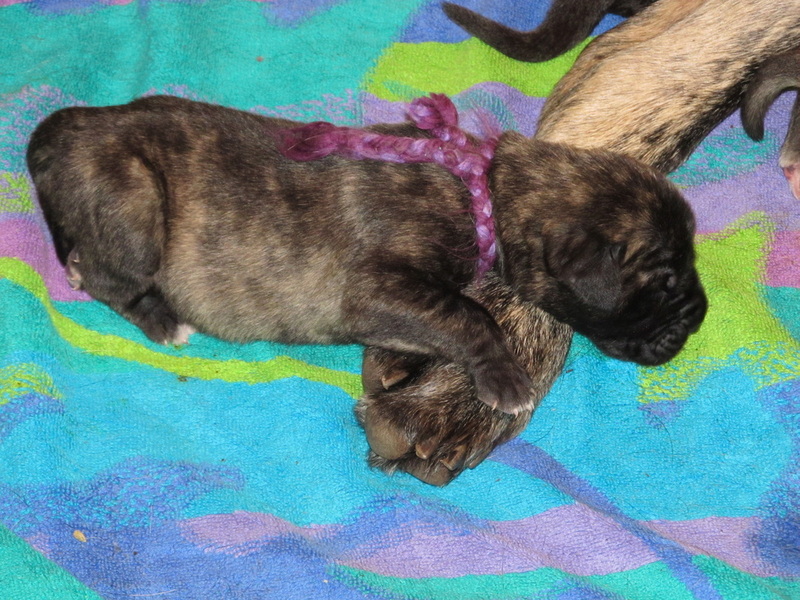 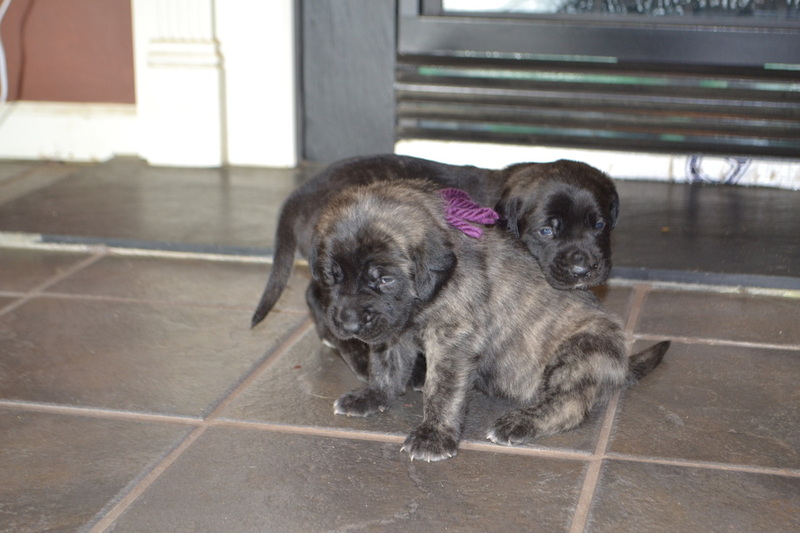 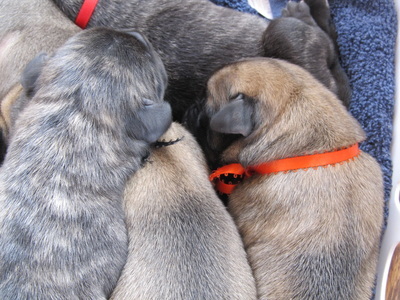 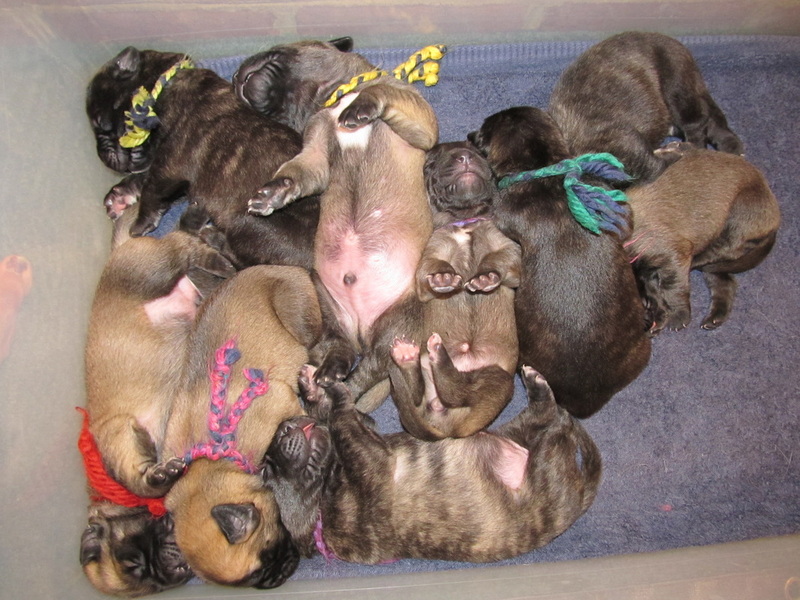 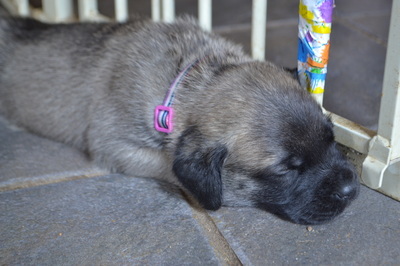 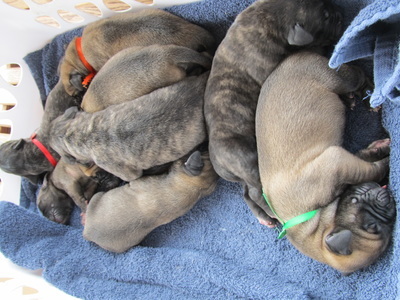 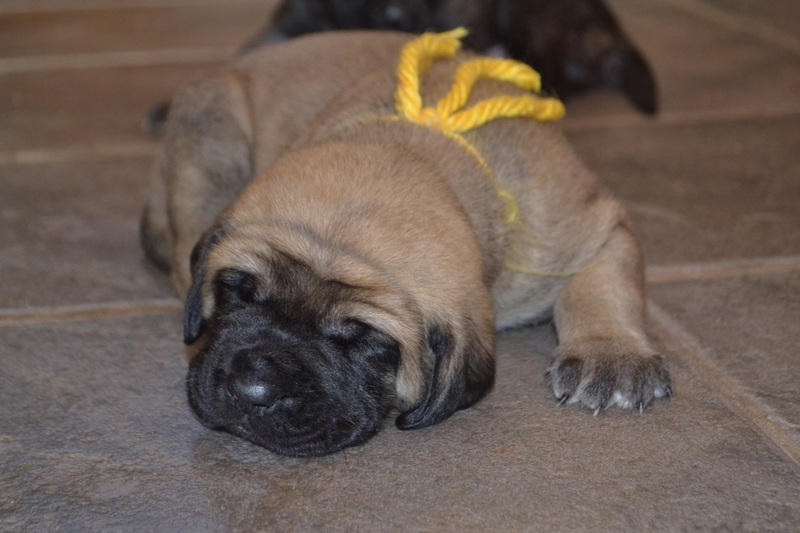 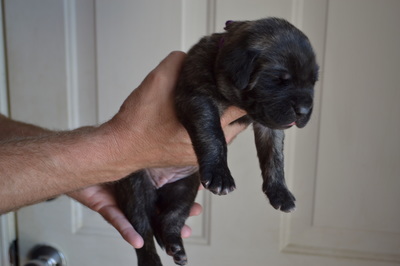 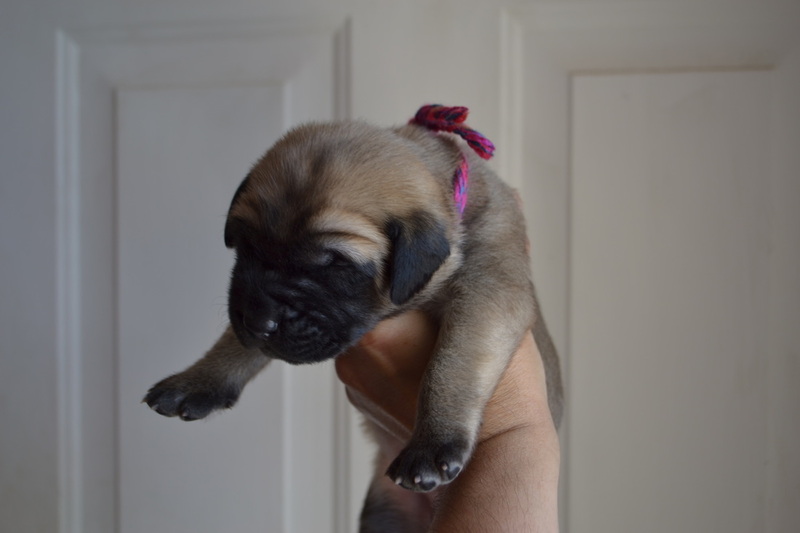 Half of the litter was delivered naturally in the living room with our assistance and the other half was delivered via emergency C-section by Dr. Patrick McHale in Lewisburg, WV at Seneca Trail Animal Hospital.. We had the honor of raising 9 little Miracle Mastiffs. 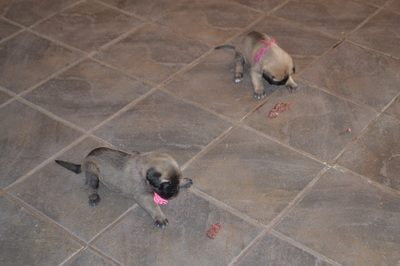 They were raised inside our home, never stepped outside until they went to their new homes. 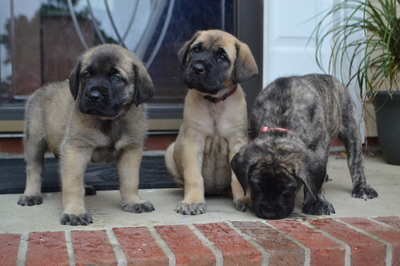 We took lots of pictures of them outside in the natural light being held and standing on the porch, but never were they outside. 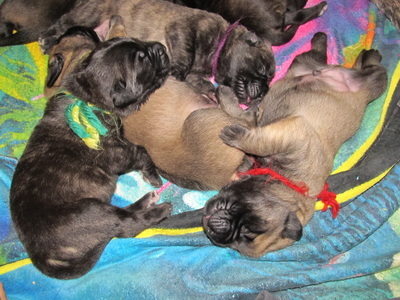 These babies were born parasite free and went to their new homes parasite free. Our vet Dr. Jenny Rodriquez at Manchester Veterinary Hospital in Spring Lake, NC was very impressed with our outstanding care to these babies. 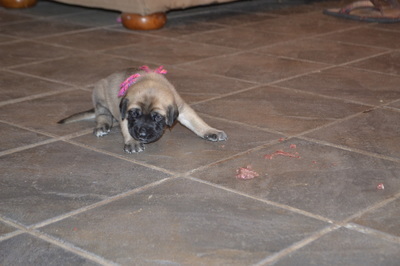 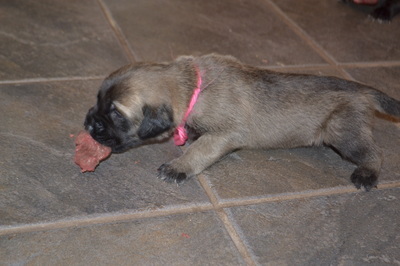 The first solid meal that the puppies received was raw deer (venison) meat that I put in the blender and minced up, rolled into little balls and they had a feast in the living room. 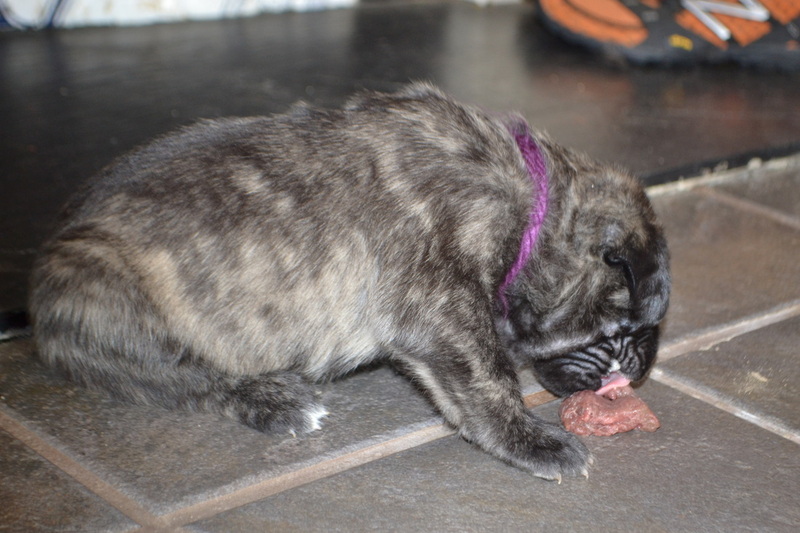 I later started grinding grain free kibble, adding yogurt and whole canned pumpkin to their daily mush feedings. As they got older we moved them from our bedroom and into our kitchen. 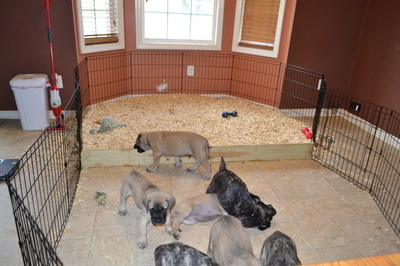 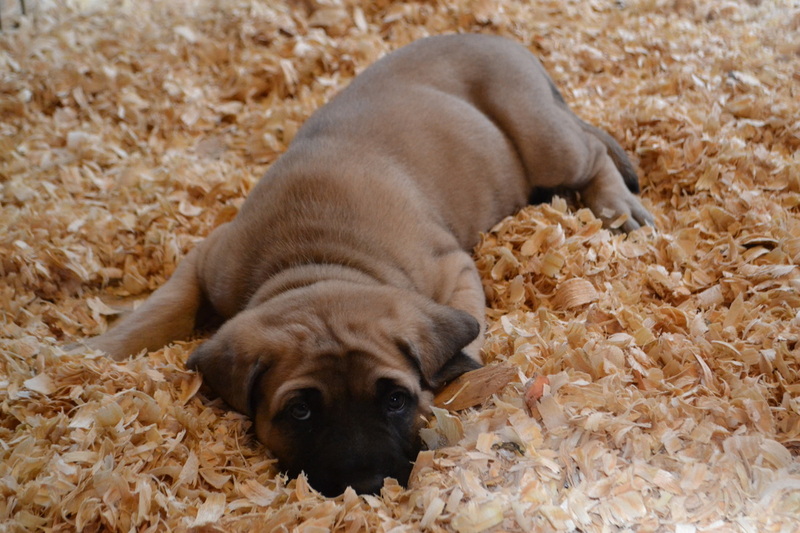 We put two puppy pens together with pine shavings and kept it clean 24/7. 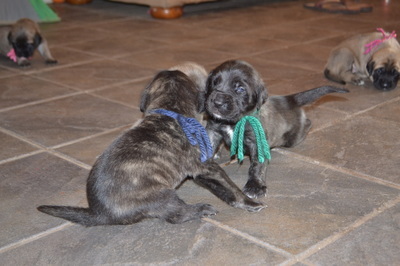 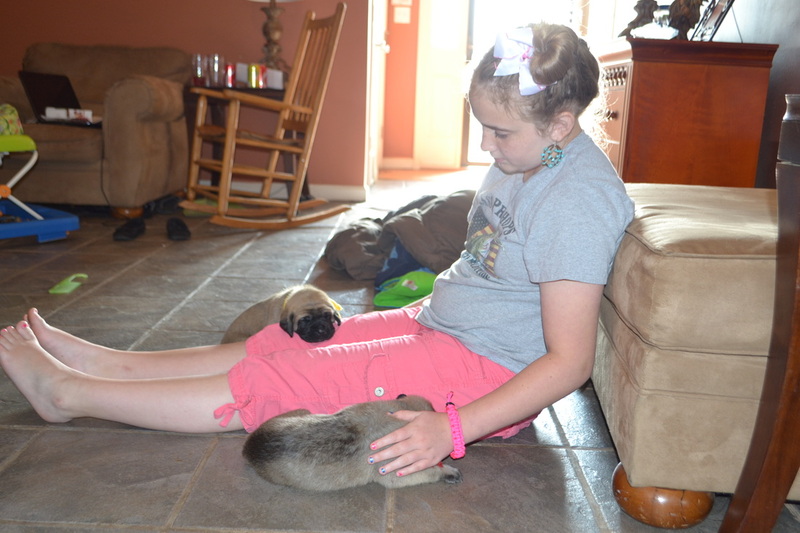 The puppies went home accustomed to lots of noises, they were loved, cuddled and stimulated every single day. 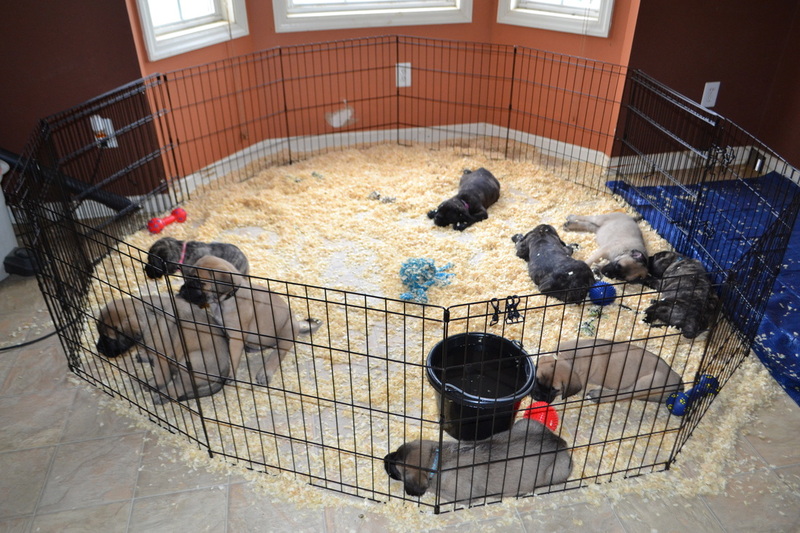 Raising nine puppies inside the house 24/7 for nine weeks was a non-stop job. The money, the time and commitment in raising a healthy and happy litter of puppies is priceless. The first couple of weeks you must have someone awake at all hours to make sure all puppies are nursing and none get laid on. 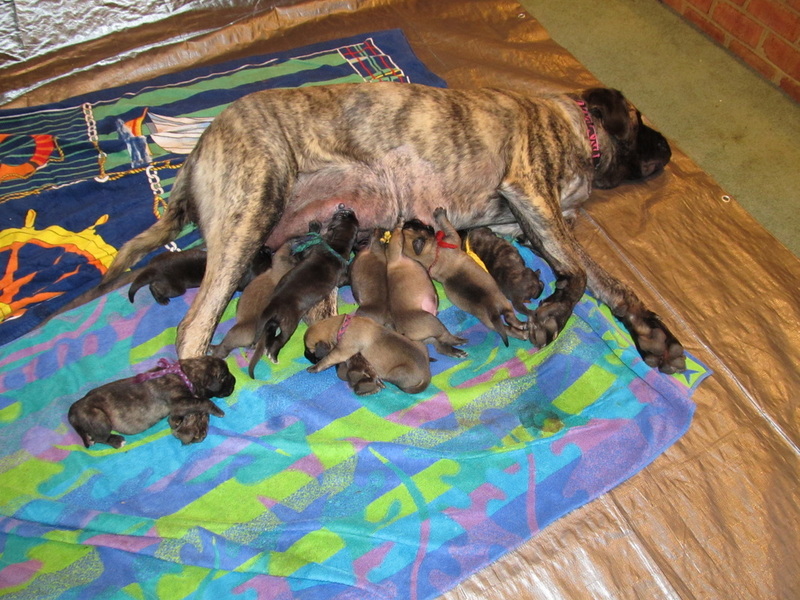 We did not lose any babies, and the Mother only had six teats. We did not have to bottle feed, Lydia was an amazing mother with a great milk supply. 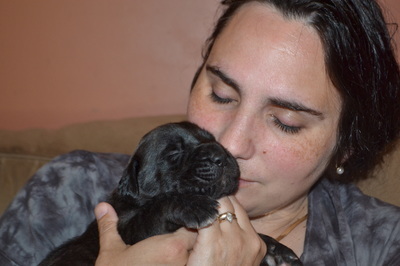 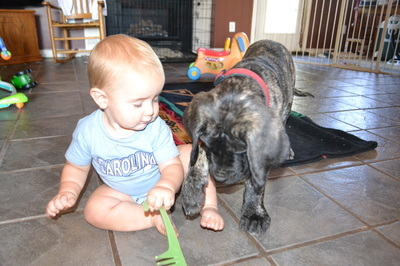 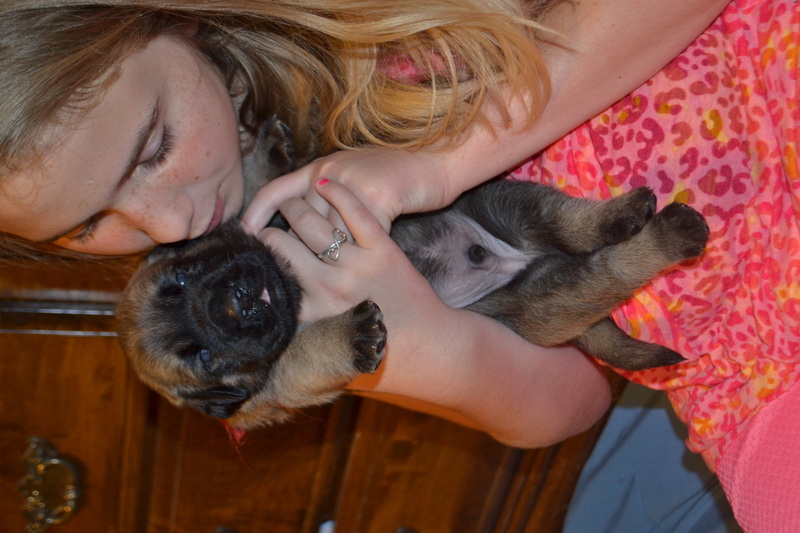 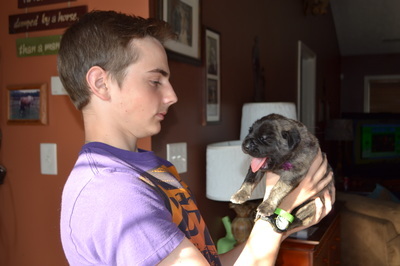 We kept one of the puppies, we call him BODE and we feel that all of our babies went to wonderful homes. 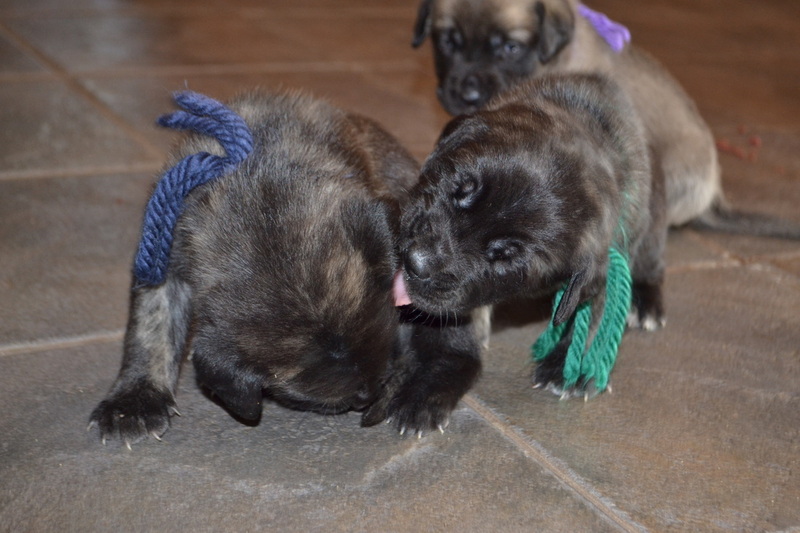 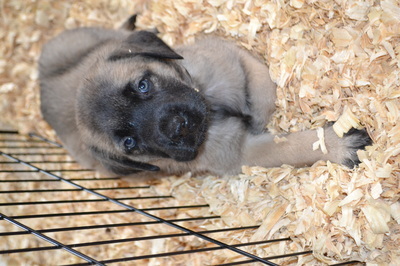 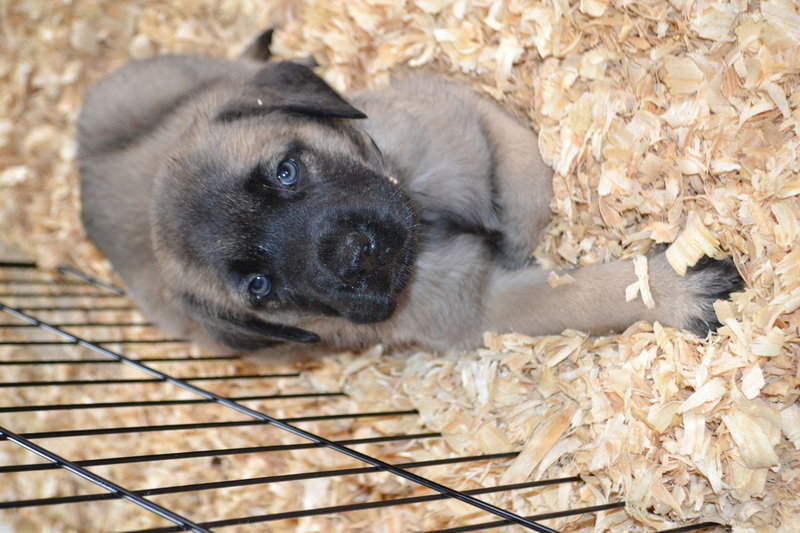 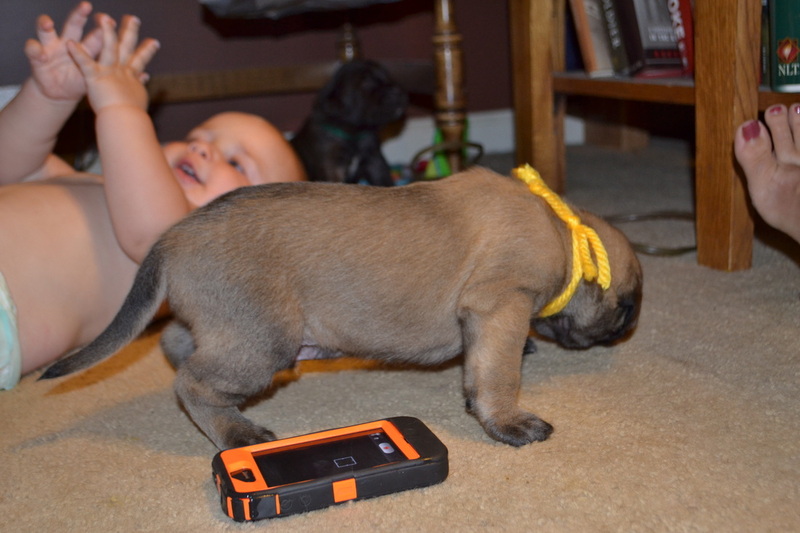 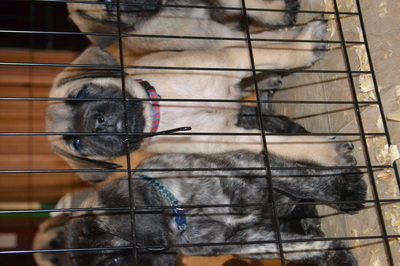 It was very hard to see them go, but we enjoy getting updates from the families who bought our precious puppies. We had a beautiful mixture of fawns and brindles and hope to have puppies again in the future.